“What seems to distinguish her, above all, is something that probably has nothing to do with her training, architectural or otherwise. It is her unerring taste.” – profile in New York Times, 1964, by Virginia Lee Warren. 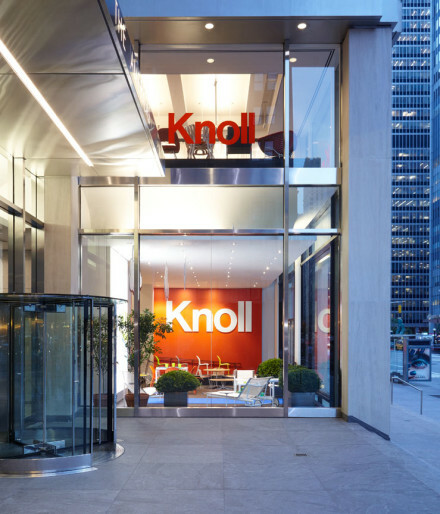 From its founding in the late 1938, Knoll has exerted a profound influence on the modern interior through the design and production of furniture and textiles and through its interior design service for private and corporate clients. Florence Knoll Bassett is one of a generation of designers who had a democratic and social understanding of design. At a time when resources were scarce, she did more with less and found inventive solutions out of necessity. She taught corporate executives that a desk could be light and approachable, serving its purpose without looking like a carved mahogany fortress. Florence Knoll Bassett’s sleek, modern, and functional designs still resonate today, and are considered classics by admirers around the world. In all aspects of design, from furniture to her archives, she has fixed her legacy as an American taste-maker. 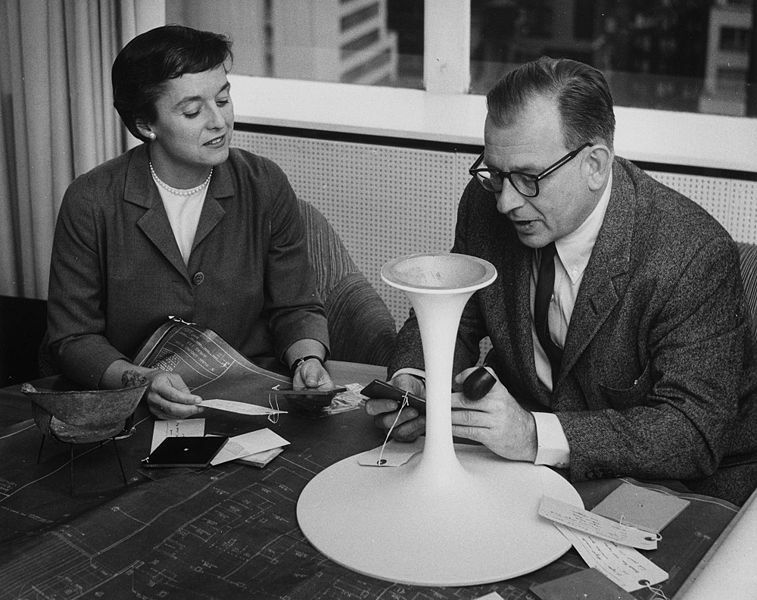 Florence Knoll directed the interior design service of Knoll Associates, The Knoll Planning Unit (1943–1971). 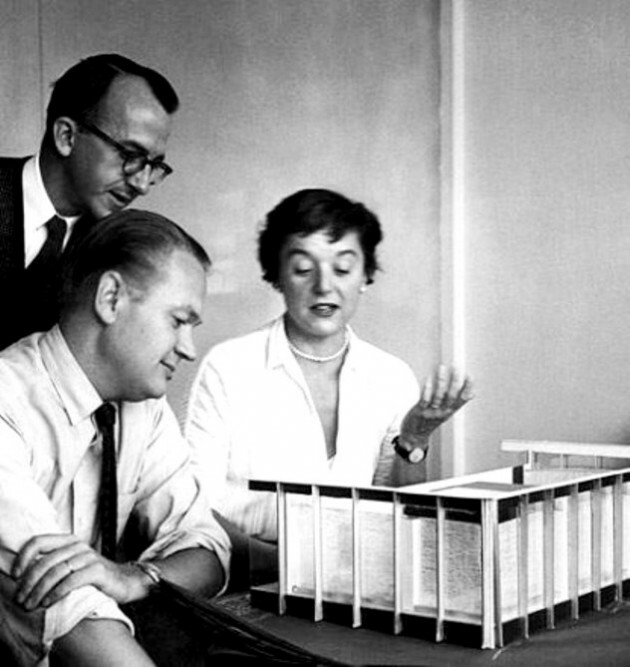 The Planning Unit was directed by Florence Knoll, who trained as an architect and designed buildings, interiors, furniture and textiles over the course of her career. Drawing on her background in architecture, she introduced modern notions of efficiency, space planning, and comprehensive design to office planning. Florence ardently maintained that she did not merely decorate space. She created it. Florence and the Planning Unit were responsible for the interiors of some of America’s largest corporations, including IBM, GM and CBS. The Planning Unit rigorously researched and surveyed each client — assessing their needs, defining patterns of use and understanding company hierarchies — before presenting a comprehensive design, informed by the principles of modernism and beautifully executed in signature Knoll style. With her attention to detail, eye for proportion, and command of the modern aesthetic, many of her designs have become as revered and celebrated as those of her colleagues. 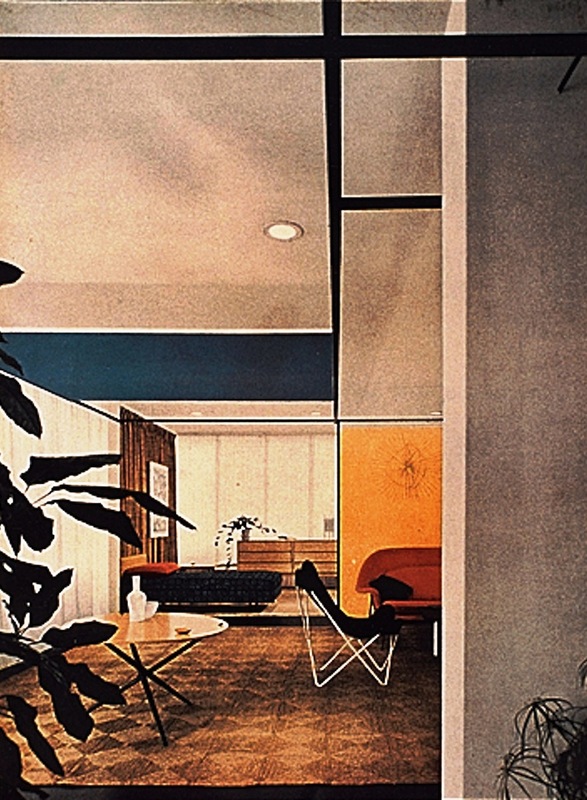 Florence Knoll was part of a movement to professionalize interior design in America and played a key role in defining the new field of interior design. The offices she designed for the Planning Unit were distinguished by a humanized modernism which combined spare form with rich textures and vivid colour. 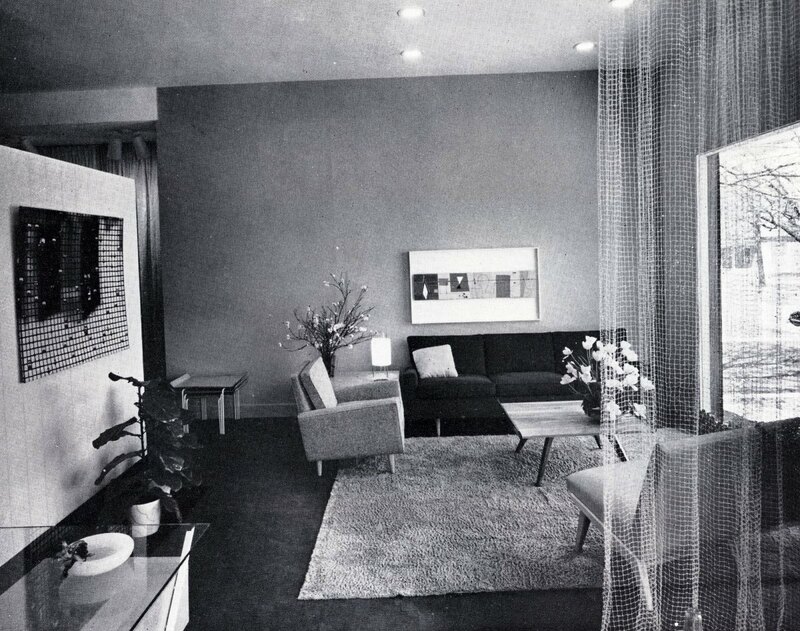 They showcased the Knoll look, a recognizable combination of furniture, colours and fabrics that became the trademark of Knoll design. 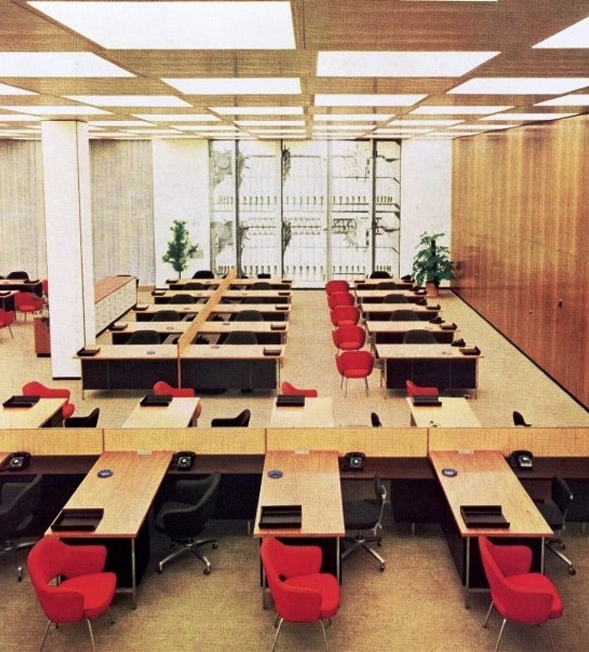 Through a combination of prestigious clients, astute promotion and skilled staff, Florence Knoll and the Knoll Planning Unit turned this corporate humanized modernism into a ubiquitous reality. 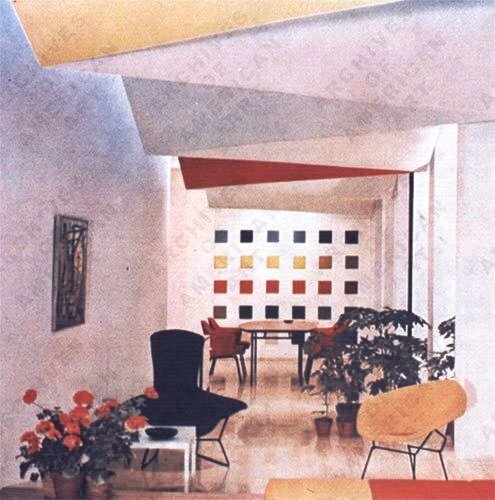 Knoll and the Planning Unit were important figures in the development of interior design from the 1940s to the 1970s. 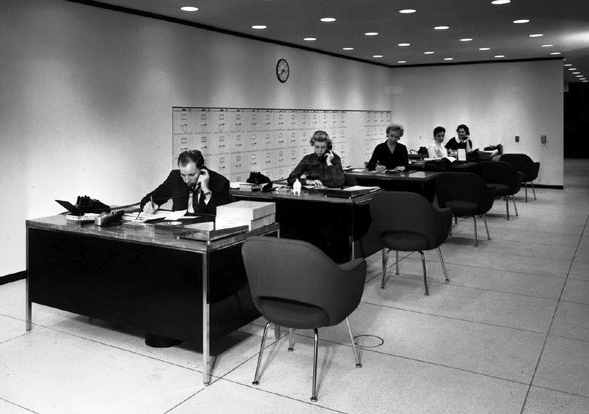 They created some of the most innovative design for office interiors during the post-war period, largely due to Knoll’s rational thinking and humanized modernism ideas. 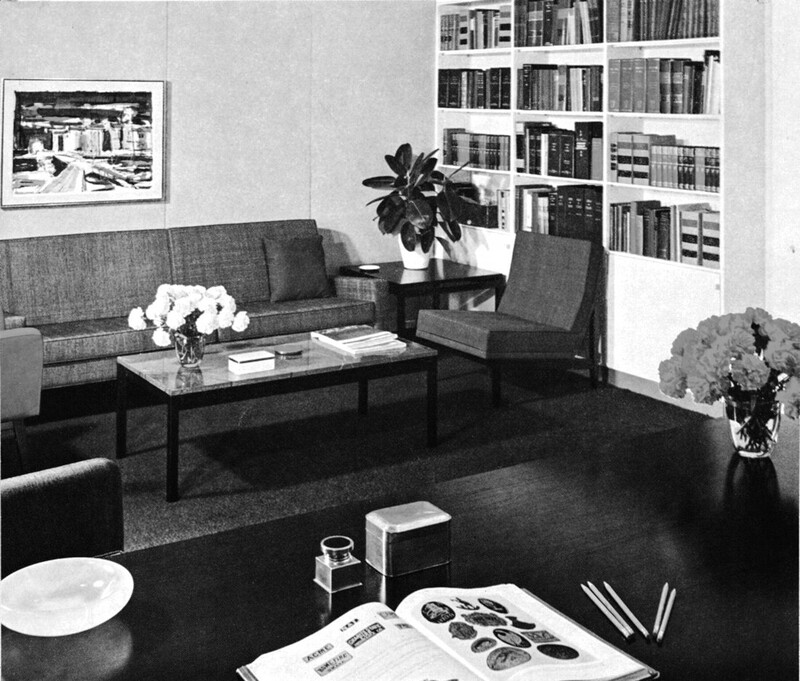 Florence knoll applied her architectural knowledge and techniques to the design of interior spaces. For example, she used the architectural method of setting and solving design problems to create spaces with a unity of function and design, which met client needs. The Planning Unit aimed to fuse architectural space and its contents by not only creating a consistent visual language of the modern office space, but also making it inhabitable and responsive to the changing needs of everyday living and working. 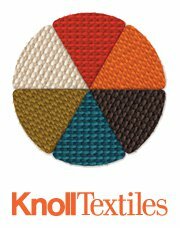 Knolls choice of furniture, textured fabrics and vibrant colour scheme (primary colours used against black, white and beige) not only became part of the Knoll look, they addressed the human desire for comfort, texture and colour. However she did not want to be confused for an interior decorator, insisting ‘I am not a decorator… the only place I decorate is my own house,’ signifying the developing profession of interior designer during the 20th century. This saw the move away from decorating rooms and towards designing. 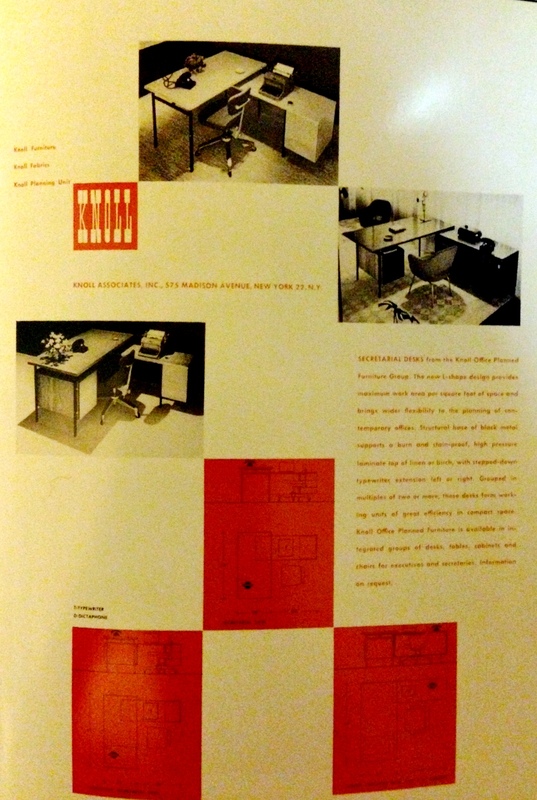 Knoll and the Planning unit had a radical influence on American office environments, beginning by replacing the traditional heavy, carved mahogany desks with modern, lighter designs, as well as, straightening the common diagonal positioning of the executive’s desk. “The traditional mid-century desk was an oblong box with many drawers and a table behind it that tended to become cluttered with paper. She redesigned conference tables into a boat-shape so that people could see one another to meet requirements for group discussions. With her architectural training, she worked to create a space that made sense from the user’s standpoint — not to just decorate, but to design. At the time, closed off spaces and richly carved executive desks placed on the diagonal were the norm — Florence has mentioned squaring off the desks was, at first, her biggest obstacle with clients. 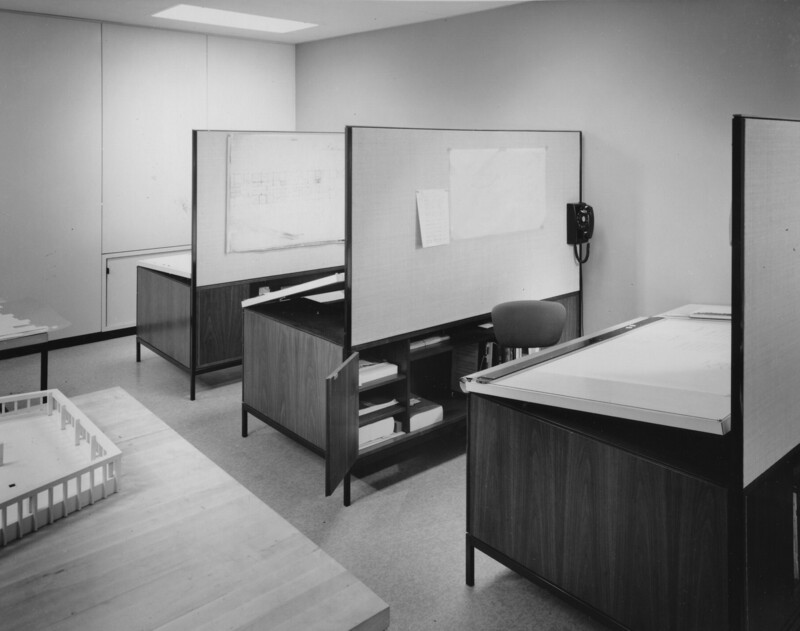 Perhaps her largest contribution to the design of office space was the Introduction of open plan workstations, which offered clients advantages of cost and flexibility over traditional private offices. This approach is still widely used today. 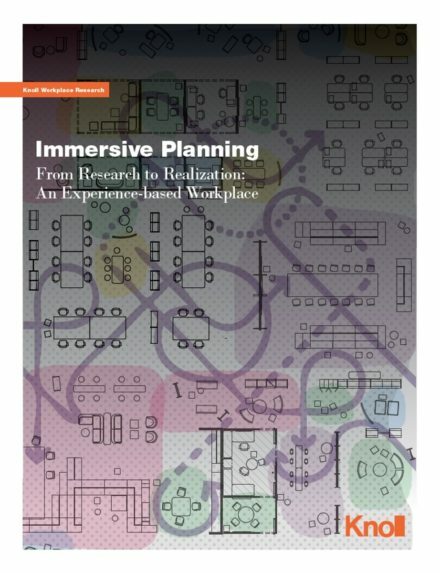 She set up the Knoll Planning Unit, which developed from her growing realization that, while clients might know very well what they needed, they were rarely able to communicate those needs. She became one of the first in the interior design industry to have lengthy meetings with everyone involved in a project to try to tease out, not what each person thought would make his job more efficient, but which elements actually would make the job more efficient. 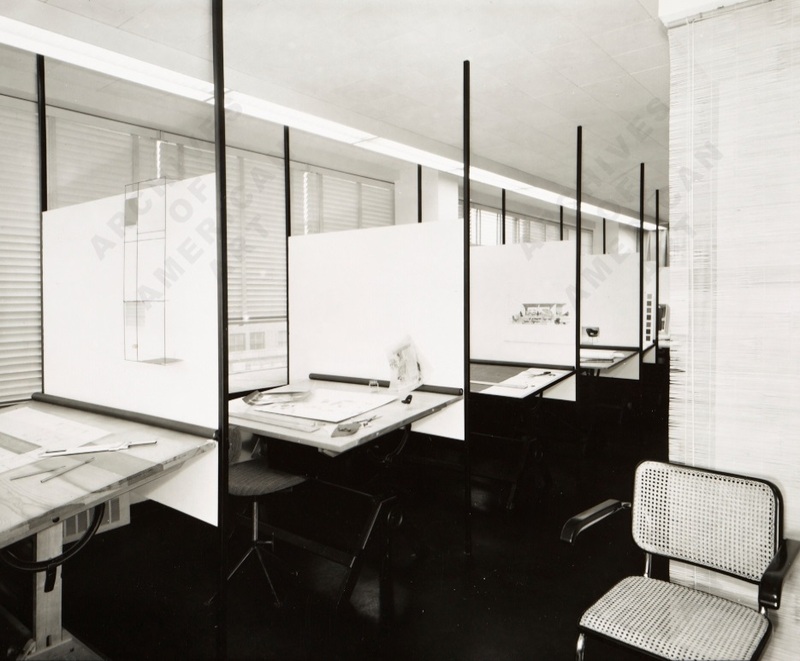 1951 – Knoll Planning Unit @ Knoll New York – shows a room with rows of cubicles, each with a drafting table. “The planning unit began when I joined Hans Knoll at 601 Madison. As the projects grew three or four designers were hired. In spite of the size of some of the projects like Connecticut General, the group never exceeded six to eight designers. We somehow managed to get the job done and on time. I don’t think I could have worked with a larger group. Heino Orro, Joe Whited and Lou Butler were with the P.U. until I resigned in 1965. 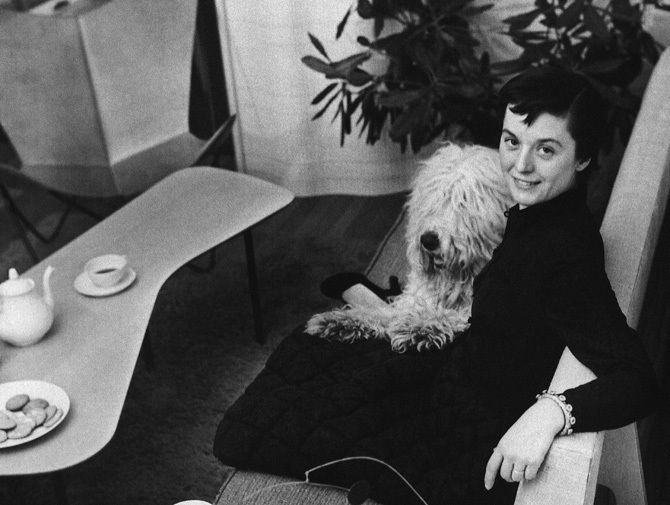 For herself, too, Florence saw Knoll as the perfect experimental design lab. 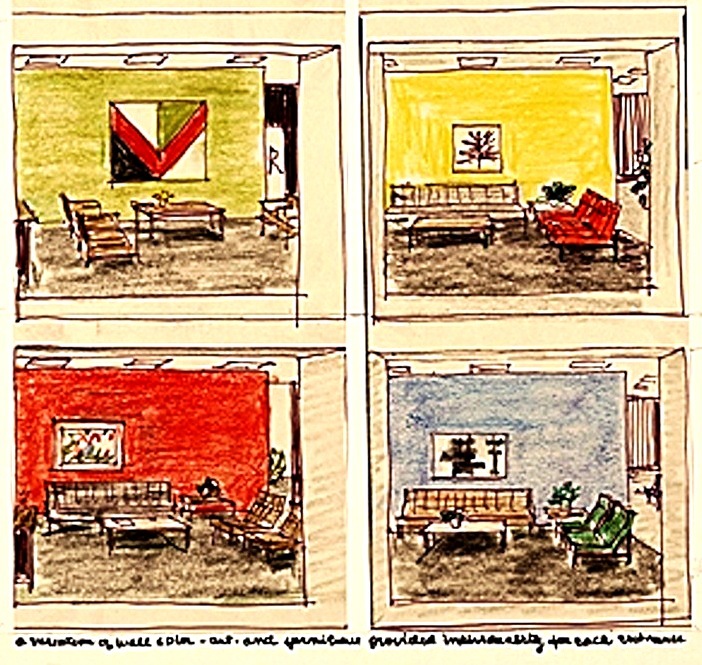 She came up with unique ways to design the various Knoll offices so that they would be selling points for new clients. 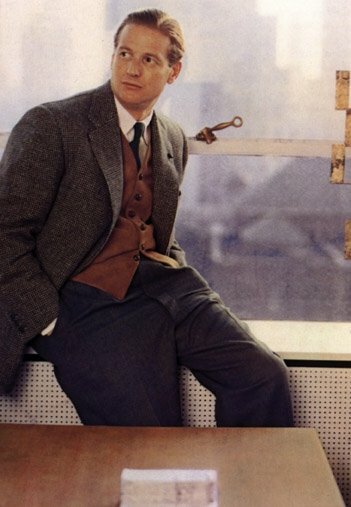 A native of Stuttgart, Germany, Hans was the son of furniture manufacturer Walter C. Knoll, who made early Bauhaus furniture for Walter Gropius, Marcel Breuer and Ludwig Mies van der Rohe, the same three who ultimately came to play a role in Florence’s development. Hans broke from his authoritarian father and started his own interior design company in England. After moving to New York, he began the Hans G. Knoll Furniture Company in 1938. Having been influenced not only by his father’s work but by the new wave of German industrial design in general, Knoll knew he wanted to make, as his father had, modern furniture for modern buildings. Hans G Knoll soon earned a reputation for its progressive line of furniture. 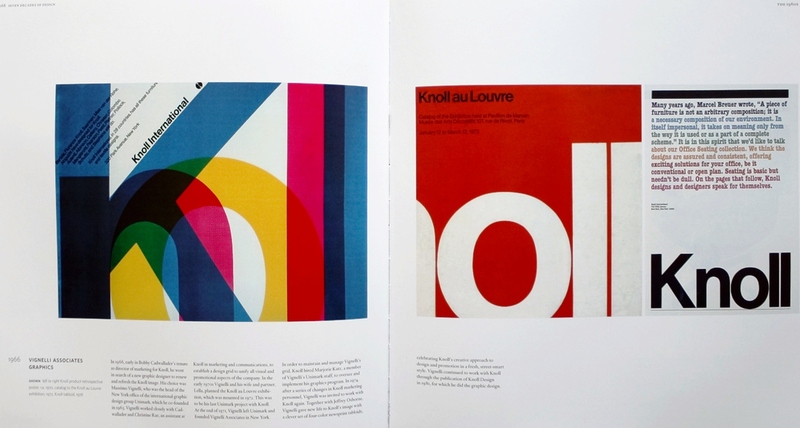 The community of modernist designers was small and she met Hans Knoll. Florence Schust began working as a part-time interior space planner for furniture designer and salesman Hans Knoll in 1943, when he offered her a project designing an office for Secretary of War Henry Stimson. Both Florence and Hans had been immersed in the Bauhaus aesthetic and philosophy at an early age. 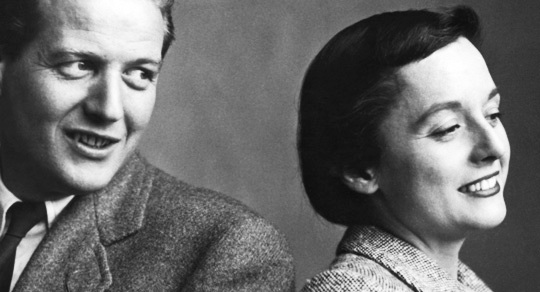 As the only woman in Knoll’s offices, she was the go-to person for interior design jobs. The two soon found they had many ideas in common. Both were infatuated with Bauhaus, certainly, which meant creating things that “represented design excellence, technological innovation and mass production,” as the company put it. Still, Florence wasn’t crazy about the furniture Hans was offering. She wanted to push it much further in a sculptural direction, and she also had some emerging ideas about the way space should be planned. Hans, a charming and relentless salesman, took over the business aspects, opening manufacturing plants in rural Pennsylvania and offices throughout the country and worldwide, while Florence gradually took complete control of every aspect of the design, from the graphics of the company letterhead and business cards to the smallest details of a new client’s offices. 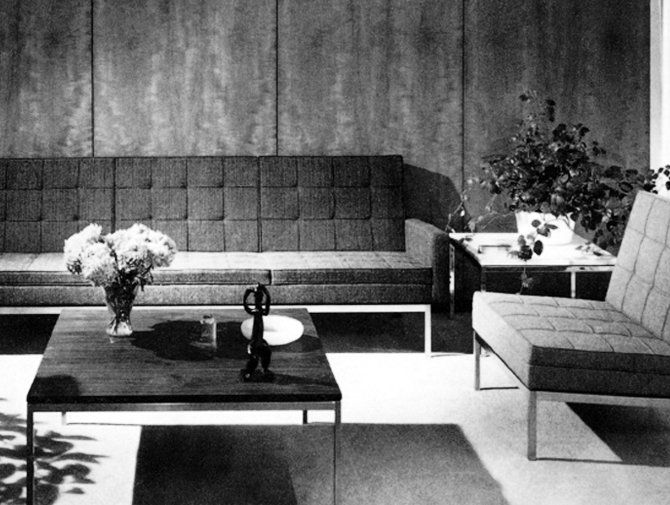 Florence saw Knoll as the perfect experimental design lab. She came up with unique ways to design the various Knoll offices so that they would be selling points for new clients. 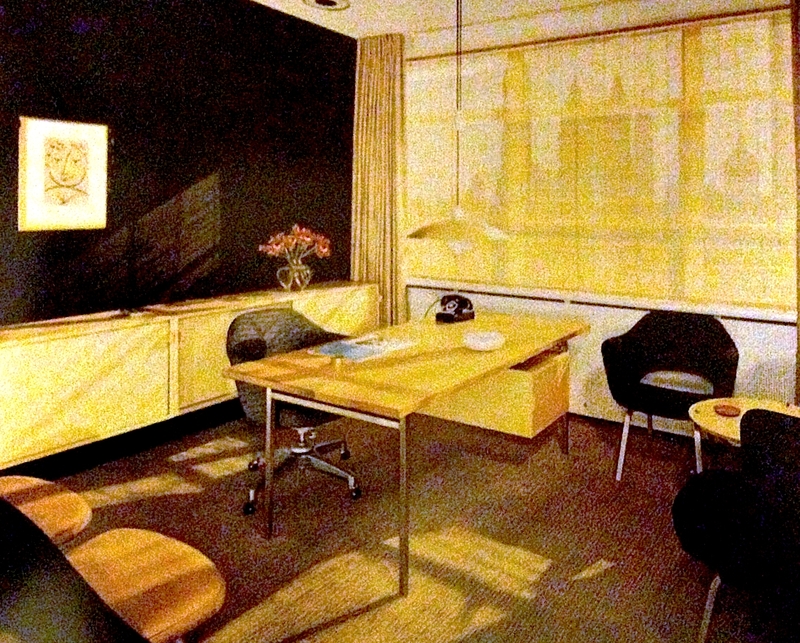 Florence Knoll sketch of Hans Knoll Office, 575 Madison Avenue, New York (1950). Once clients realized the actual dimensions of the space versus how large it seemed, they were sold. Even though Florence Knoll Bassett left the professional design sphere in 1965, her approach to design as a practice still remains highly significant of a particular historical climate and should be reconsidered in the complex contemporary corporate design work. In fact, speaking about her work, Mrs. Knoll Bassett says: “I was fortunate to have good clients. The success of a good project depends upon the compatibility of client and designer”. Nevertheless, if you look back at her career you understand that it would have never happened without her dedication, profound knowledge and wit. The Planning Unit not only specified furniture models and arrangements but also corresponding textiles, carpets, window treatments and office accessories. 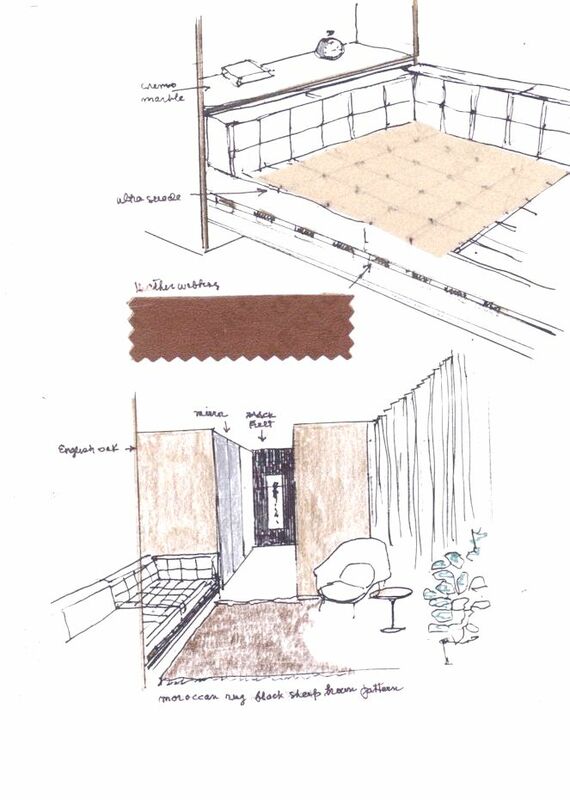 She’d send drawings with little squares of (Knoll) fabric glued to the blueprints, just like the sketch below. NB it was before e-mail and the internet – all Florence’s correspondence was hand-written and sent by FedEx. 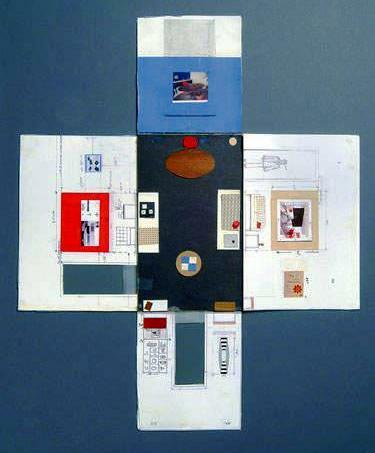 The paste-ups were abstract and balanced, so if a large element such as a desk was placed on one side of the collage, it would be balanced by an element of a similar proportion such as a sofa at the opposite end of the board. These collages convey the feeling of a space and proved to be an effective client presentation tool. This technique was successful because it expressed the experience of a space more accurately than a drawing and was simple to understand. 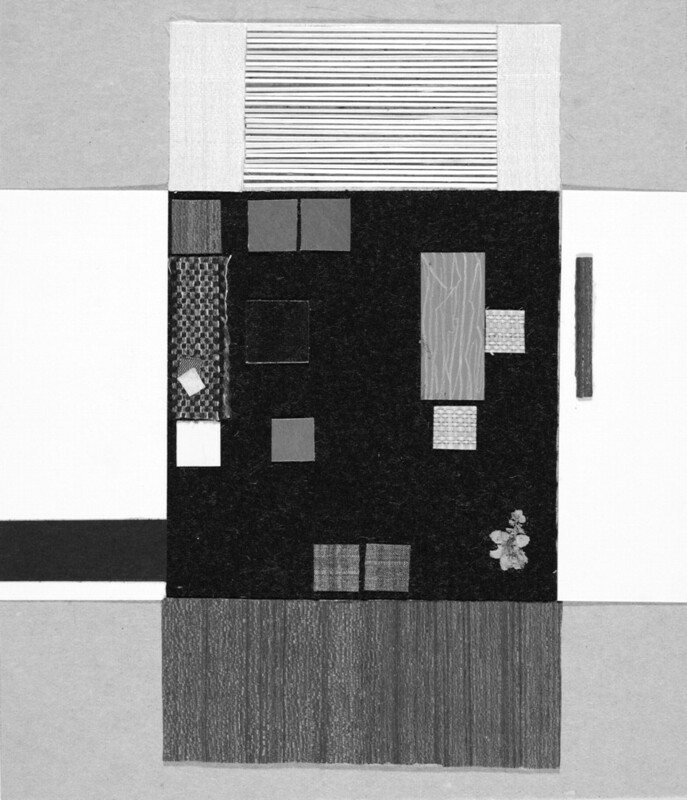 The paste up was a small representational plan of the space with fabric swatches, wood chips and finishes attached to represent furniture and other details. This communicated both the materiality and arrangement of sofas, chairs, desks and credenza. This communication method was vital in convincing clients to move towards modernised workspaces. Paste-ups present a correspondence between their graphic elements and the spatial elements of furniture layouts, textures and colours of her complete office and showroom spaces. She is credited with elevating standards of furniture manufacture to a new level of quality. Her exactitude could be frustrating for those who worked under her, but the result was worth it. 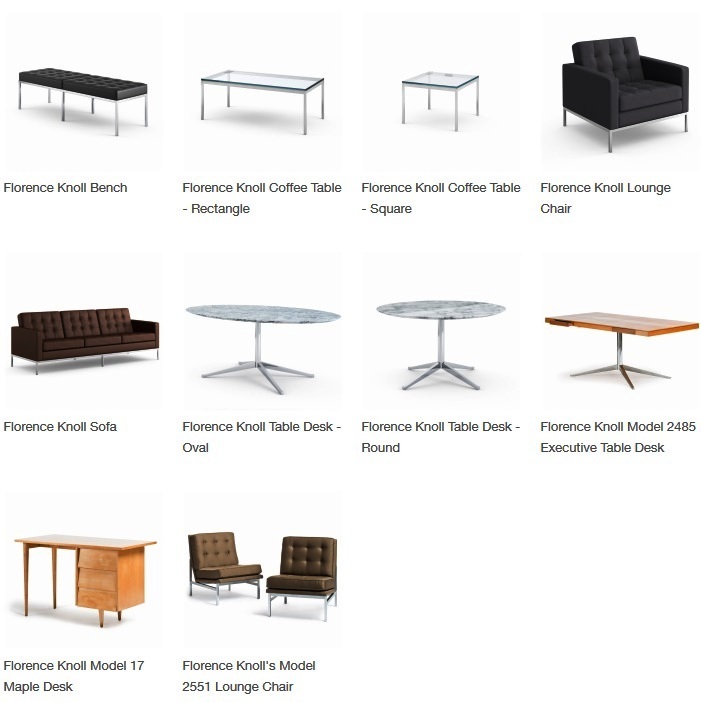 As part of her work with the Planning Unit, Florence frequently contributed furniture designs to the Knoll catalog. Heart-felt modernism perhaps best describes Knoll’s style. Her pieces generally fitted into the International style – a post-Bauhaus doctrine favouring clean lines and the use of chromed metal. She also used bright colours, textured fabrics and finishes such as marble and saddle leather. Not only did Knoll revolutionise office planning from the ’40s to its peak in the ’60s, she also designed a huge number of furniture pieces between 1954 and 1961. 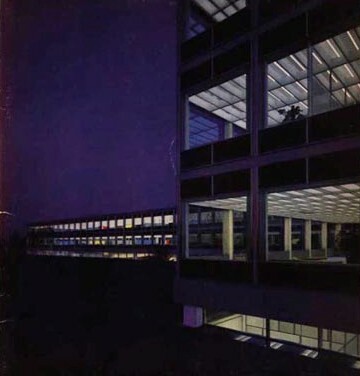 As skyscrapers rose up across America during the post-war boom, Florence Knoll saw it as her job to translate the vocabulary and rationale of the modern exterior to the interior space of the corporate office. Thus, unlike Saarinen and Bertoia, her designs were architectural in foundation, not sculptural. She scaled down the rhythm and details of modern architecture while humanizing them through color and texture. Although Knoll did a great deal of residential work, the International Style she worked in was especially successful in corporate offices. She humbly referred to her furniture designs as the “meat and potatoes,” filler among the standout pieces of Bertoia, Mies, and Saarinen. Florence herself was a credentialed architect, although she described the pieces that she designed (with a modesty that seems ludicrous given the fact that her pieces are now displayed in MoMA, the Metropolitan Museum, the Louvre and the Smithsonian) as “fill-ins” – cabinetry and such that was needed after the initial designs had been completed. As a furniture designer, Knoll’s most famous pieces include 1954’s range of lounge seats, as well as the elegant Partner table desk and credenza from her 1961 Executive Collection, all of which are still in production by Knoll. Florence was a strong proponent of considering all the elements of a space and the way they relate to one another, so when furniture in the current Knoll catalog didn’t work for a project, she designed something that did. Iconic pieces like her credenza and boat-shaped conference table are examples of her commitment to that idea. As head of the Knoll Planning unit, Florence Knoll always approached furniture design with the larger space in mind. Most important to her was how a piece fit into the greater design — the room, the floor, the building. 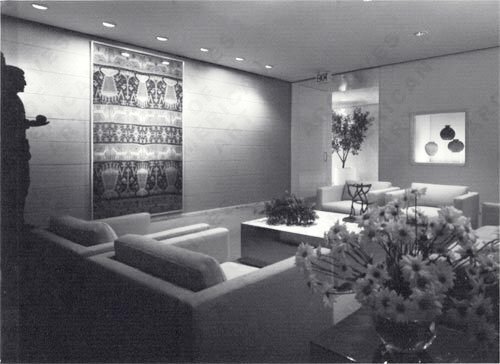 Every element of a Knoll-planned space supported the overall design and complemented the existing architecture. And while she never regarded herself as a furniture designer, her quest for harmony of space and consistency of design led her to design several of Knoll’s most iconic pieces—all simple, none plain. 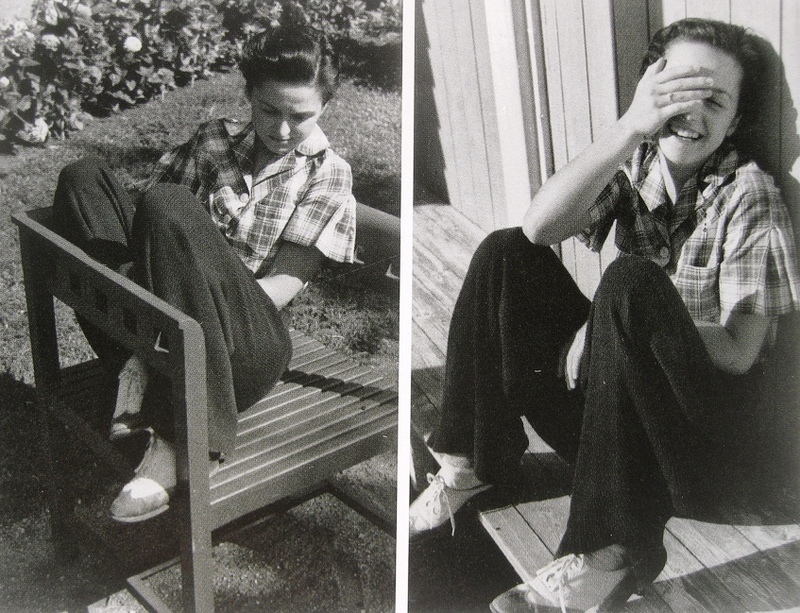 Knoll’s distinctive furniture designs (her signature bench is among several of her designs still in production today) were marked by sleek silhouettes and geometries that reflected her architectural training. 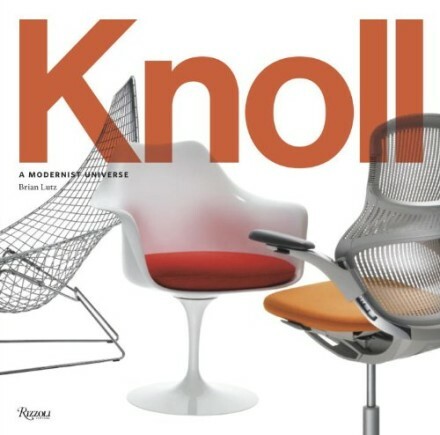 Knoll won four of the Museum of Modern Art’s “Good Design” competitions, and the company’s designs are still displayed today on MoMA’s top floor. Her American interpretation of minimalist rationalist design theories is clearly evident in Knoll’s storage pieces. She mixed woods and metals to great effect and added laminates as they became popular. Dressers and desks are all square in design but never lack for quality. Hanging cabinets have glass shelves, sliding doors and drop down fronts that can be used as bars. In the 1950s Florence Knoll’s work was often displayed at the Museum of Modern Art’s “Good Design” exhibits. Knoll only designed furniture when the existing pieces in the Knoll collection didn’t meet her needs. Almost half of the furniture pieces in the Knoll collection were her designs including tables, desks, chairs, sofas, benches and stools. She designed furniture not only to be functional, but also to designate the way she wanted the interior space to function as well as relating to the architecture of the space and the overall composition. The distinctive features of Florence Knoll’s furniture designs were the sleek silhouettes and geometries. This reflected her architectural training and interests. Her furniture was designed with the notion of transforming architecture into furniture, which she achieved by translating the structure and language of the modern building into a human-scaled object. An ideal example of this is her 2544 credenza, which was a marble topped, rectangular case with metal legs. Its structure was clearly influenced by the Mies’ Seagram Building and Corbusian columns. She mostly kept the upholstery colour palate in black, brown and beige to let the vibrant colours and rich textures in the interior spaces remain the focus (some pieces did come in bright red). 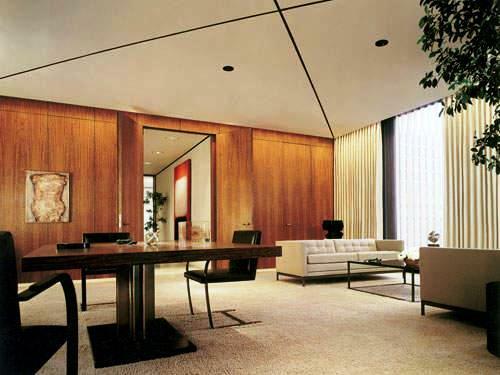 This 1961 marble-top credenza was influenced by Mies van der Rohe’s Seagram Building and Corbusian columns. 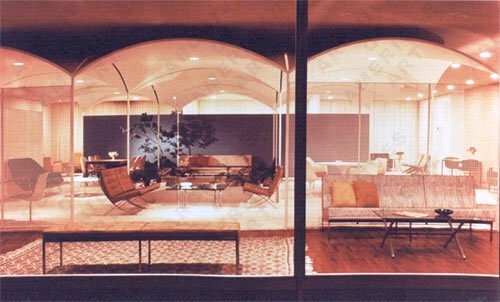 Florence designed regional showrooms in New York, San Francisco, Los Angeles, Chicago and Milan – that fluently communicated the Knoll brand and showcased the company’s products with color and great modern style. The Knoll showrooms embodied their humanised modern designs, showing the customers how to use their new furniture. 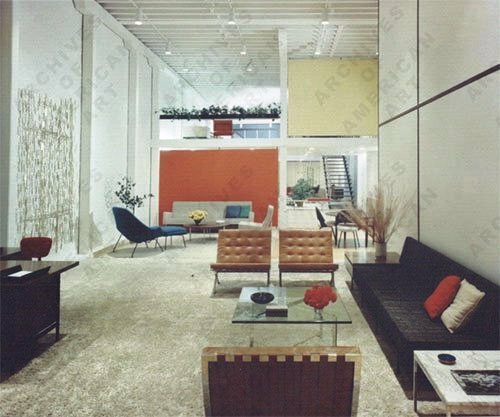 These showrooms did not exhibit office interiors but rather living room and lounge arrangements to show different solutions in interior design through the Planning unit and Knoll furnishings. Residential customers were more experimental in their colour, texture and shape selections of Knoll designs, whereas the corporate clients preferred more functional looking design. 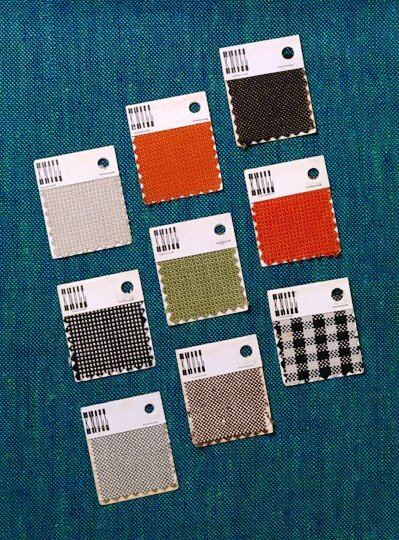 In 1947, the year after their marriage, Hans and Florence Knoll added a third division, Knoll Textiles, which brought textile production in line with a modern sensibility that used colour and texture as primary design elements. In the early years, the company hired leading proponents of modern design as well as young, untried designers to create textile patterns. The division thrived in the late 1940s through 1960s and, in the following decade, adopted a more international outlook as design direction shifted to Europe. In the late 1970s and 1980s, Knoll tapped fashion designers and architects to bolster its brand. A feature of most 20th-century design collections, the “Womb” chair’s fabric, usually a Knoll textile and a dominant design element, is rarely, if ever, identified. “In modern interior design, the role of the furniture designer is well documented, but the importance of the textiles on their furniture was never talked about,” Martin said. The lack of recognition is perhaps partly attributable to the concentration of women in textile design. “In the field of design, it was fairly characteristic for women to be pushed into textiles,” Martin explained. 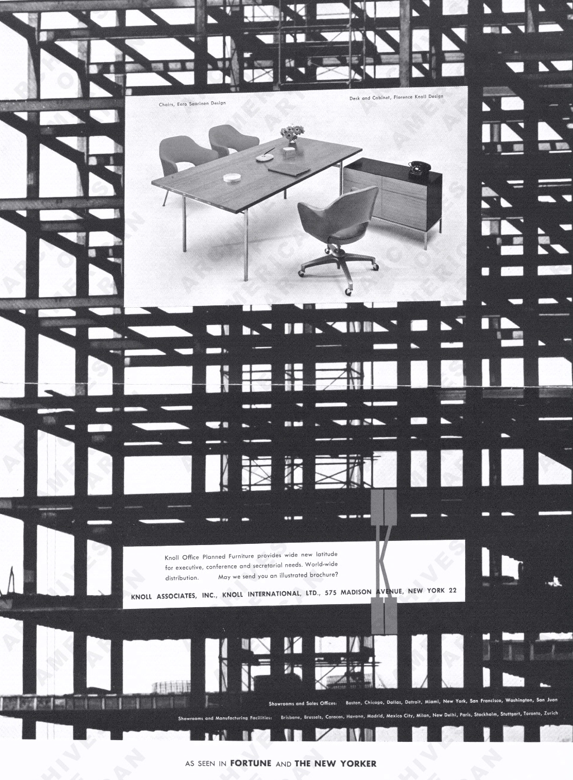 With Schust as its director, Knoll’s Planning Unit was formed to create complete interiors, primarily for the commercial market. 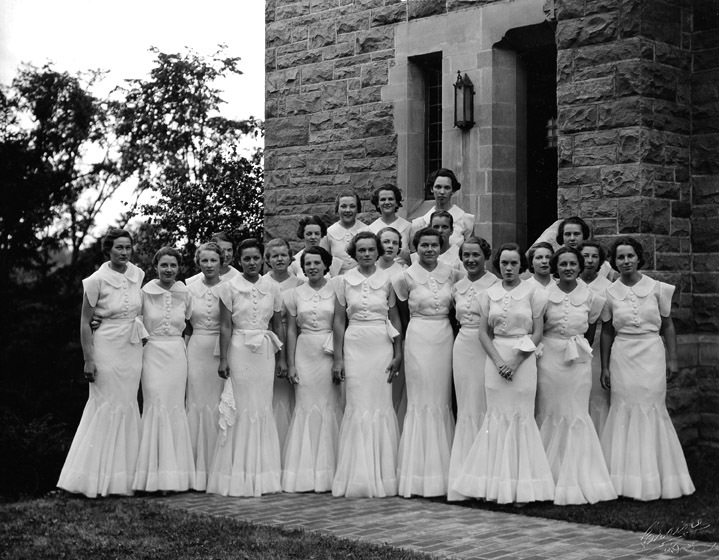 Though the firm had experimented with textiles since 1942, it formally added textiles as a third division in 1947. She was a driving force. She brought to textile production a modern sensibility that used color and texture as primary design elements. Early on, the firm hired young, untried designers, along with leading proponents of modern design, to create textile patterns. Core designers included Astrid Sampe, Marianne Strengell, Sven Markelius, Angelo Testa, Stig Lindberg, Eszter Haraszty, Suzanne Huguenin, and Evelyn Hill Anselevicius. If Florence Knoll didn’t like it, they didn’t make it. When you study the working lives of famous architects, some appear to have been as solitary as a skyscraper, with nameless assistants blending into the skyline around them. 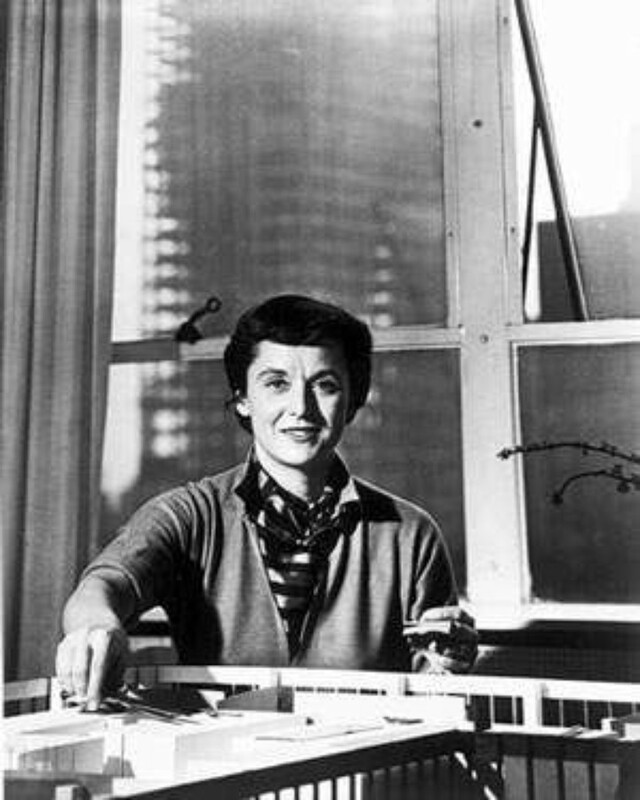 But Florence Knoll, the brilliant American architect, interior space-planner and furniture designer, had a gift for collaborating with others and for recognizing and promoting great work. Florence Knoll helped create Knoll with an elegant steeliness that contrasted with her adorable looks and nickname. She assisted in bringing into form some of the most enduring design products of modernist luminaries like Ludwig Mies van der Rohe, Isamu Noguchi, Eero Saarinen and Marcel Breuer, at the same time producing singular interiors and furniture of her own. Her achievements would have been remarkable for anyone, but for a woman in postwar corporate America they were extraordinary. She bucked tradition, attributing design credits and paying royalties to designers, an unusual practice in the furniture industry. Florence Knoll’s connections with leading and emerging contemporary furniture designers opened up new venues for these designers, which may not have been possible without her eye for the total package and the company’s commitment to crediting architects and designers by name and paying them royalties. Knoll Associates’s support and promotion of these now–iconic designers were contributing factors to their long–term success. 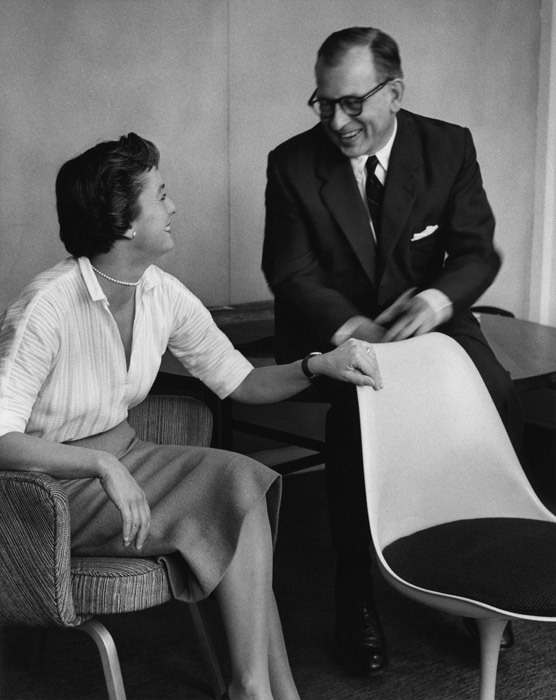 Under her leadership, many modern masters created iconic pieces for Knoll, including Eero Saarinen’s Tulip chairs and pedestal tables (his tables sit in front of a Knoll sofa in her Miami home), Isamu Noguchi’s coffee table, Harry Bertoia’s wire furniture and Richard Schultz’s outdoor collection. Today, many of the furniture pieces commissioned by Knoll or designed by Knoll herself are represented in the modern design and decorative arts collections of major art museums across the country, and in Canada and Europe. It is a rare modern design aficionado who does not crave at least one piece of furniture by Eames or Saarinen, or a Bertoia wire chair, for their own living space. 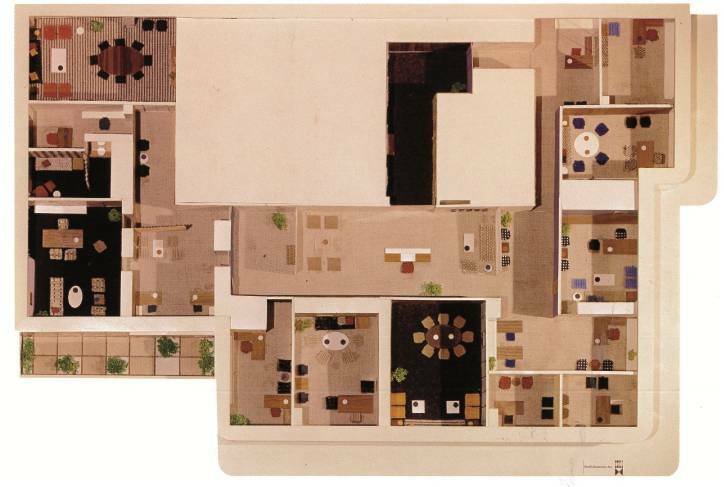 As a pioneer of the Knoll Planning Unit, she revolutionized interior space planning. 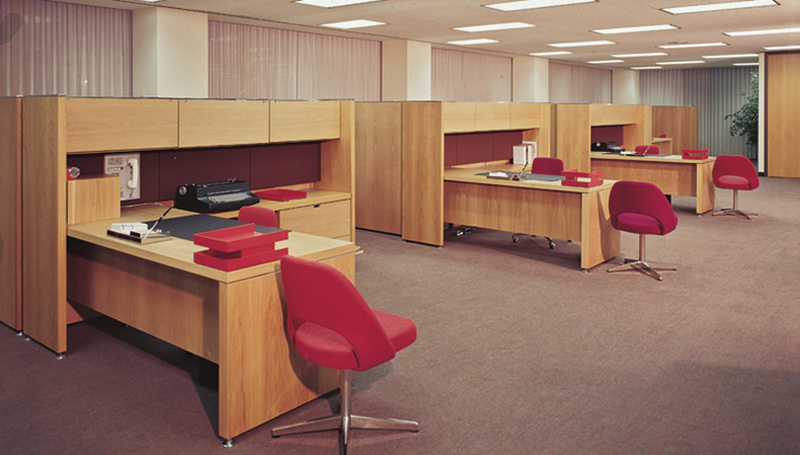 In creating the revolutionary Knoll Planning Unit, Florence Knoll defined the standard for the modern corporate interiors of post-war America. 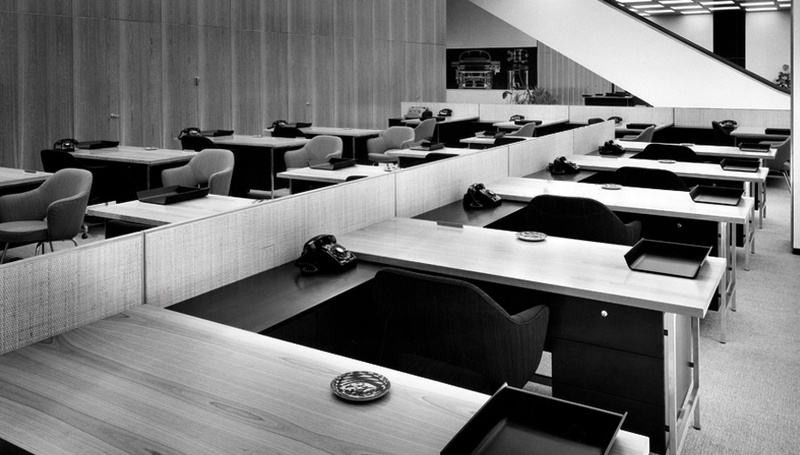 Florence’s Knoll Planning Unit transformed the standard American workplace from dark and drab to light and open. 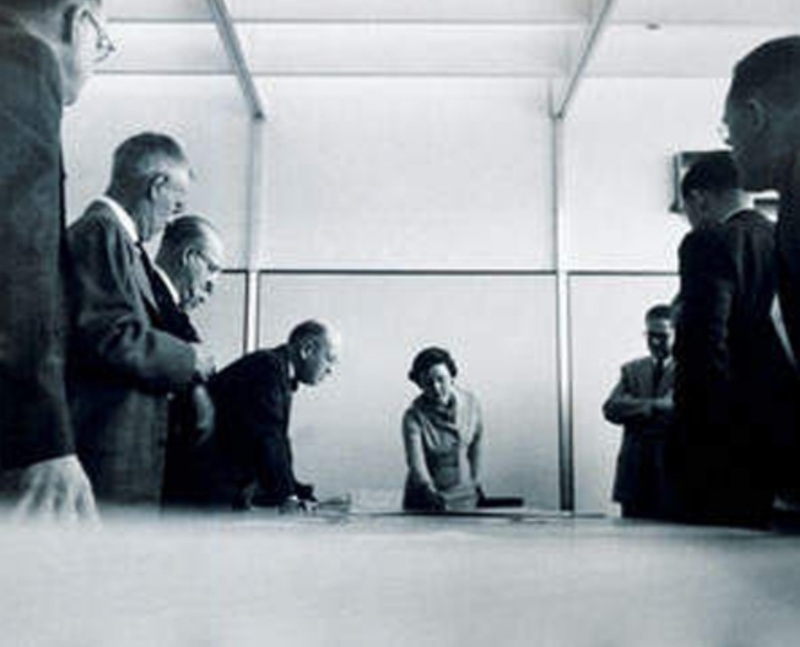 1960, Florence Knoll retired as President of Knoll to become Director of Design then resigned five years later. 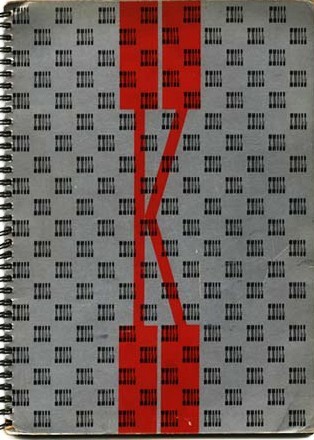 Although several experienced designers remained in the Knoll Planning Unit, without her guidance the company’s intentions changed and conflict of ideas arose between staff members. Due to this, the company’s success went down hill and The Planning Unit ceased operation in 1971. 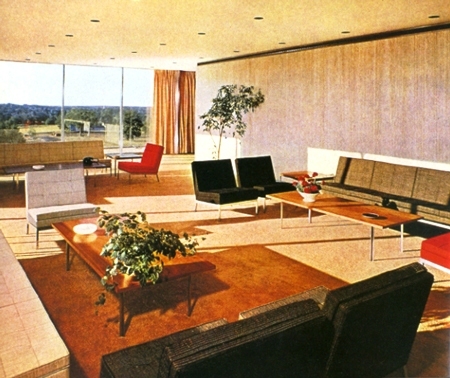 Florence Knoll designed acclaimed office projects for CBS in New York, the Rockefeller family, Look Magazine, Connecticut General Life Insurance in Bloomfield, First National Bank of Miami, and H.J. Heinz Company Pittsburgh, IBM, and General Motors – all embraced this new way of organizing business space. Her vision for the new office was clean and uncluttered, and the corporate boom of the 1960s provided an opportunity for her to change the way people looked at the workplace. Her open plan layouts created clean, uncluttered spaces a perfect venue for her furniture. 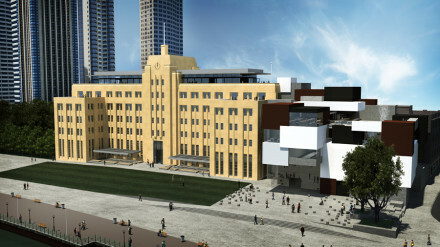 Both Hans and Florence had great connections eg through their friendship with Howard Meyers, editor of Architectural Forum, for example, they got a commission to design the Rockefeller offices at the top of New York’s Rockefeller Plaza. Florence went on to design projects for the Connecticut General Life Insurance building, the CBS building, the Seagram’s and Look magazine offices and the Heinz Company headquarters, staying on at the company for ten years after Hans’ death in 1955. Knoll made a name for herself in the 1980s in Miami, where she eventually settled, by campaigning—with ultimate futility, as it happened—against billboards. ‘The Southest Bank Building in Miami, Florida, was designed by Charles Bassett (no relation). He was the chief designer for the Skidmore, Owings & Merrill firm in San Francisco. 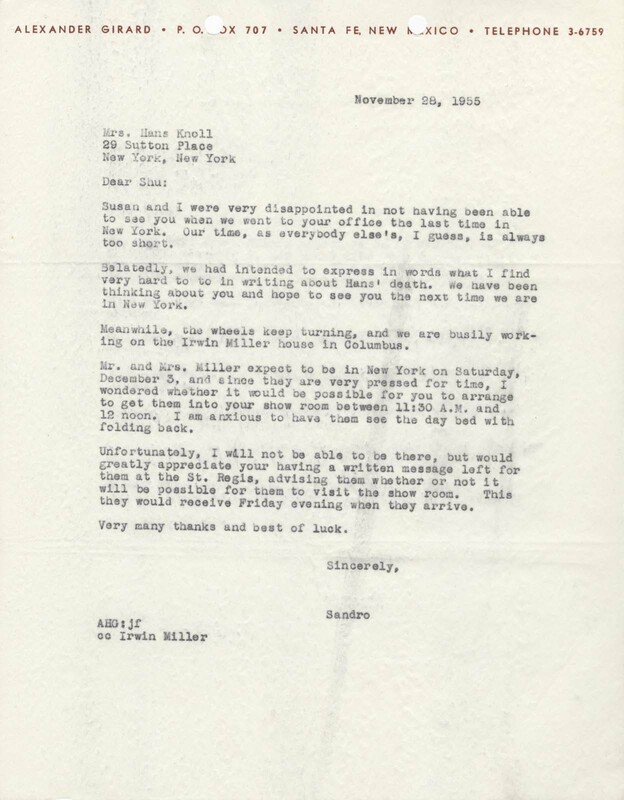 For this CBS project Florence Knoll commented on former president Frank Stanton ( a longtime friend and favorite client ). This project centred around making a space interesting when confronted with a repetitive module. At the pinnacle of her career in 1965, she withdrew from the design world after completing the interiors of the CBS headquarters. She was then cared for by Emile Tessin, a friend of the family whom her mother had appointed as Florence’s legal guardian in the event of her death. Kingswod was part of the newly created Cranbrook educational community. 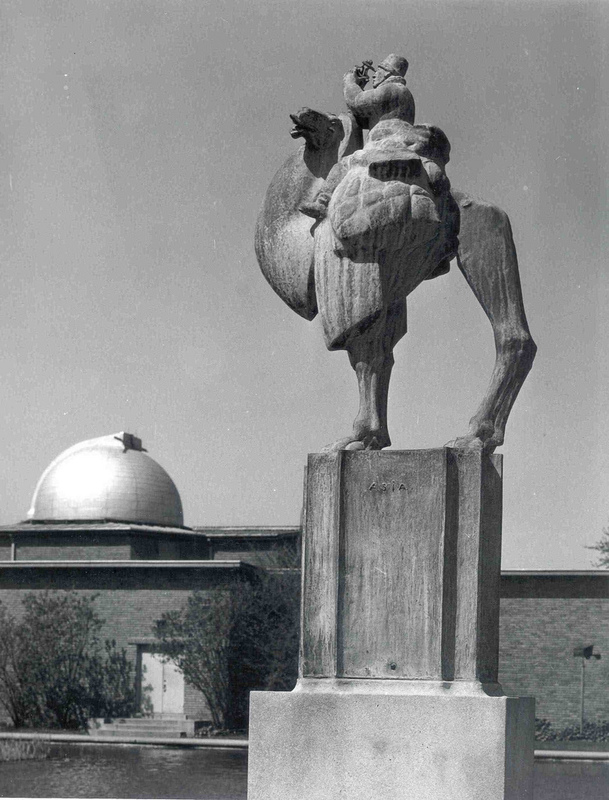 She began her architectural studies under the school’s art director, Rachel de Wolfe Raseman. 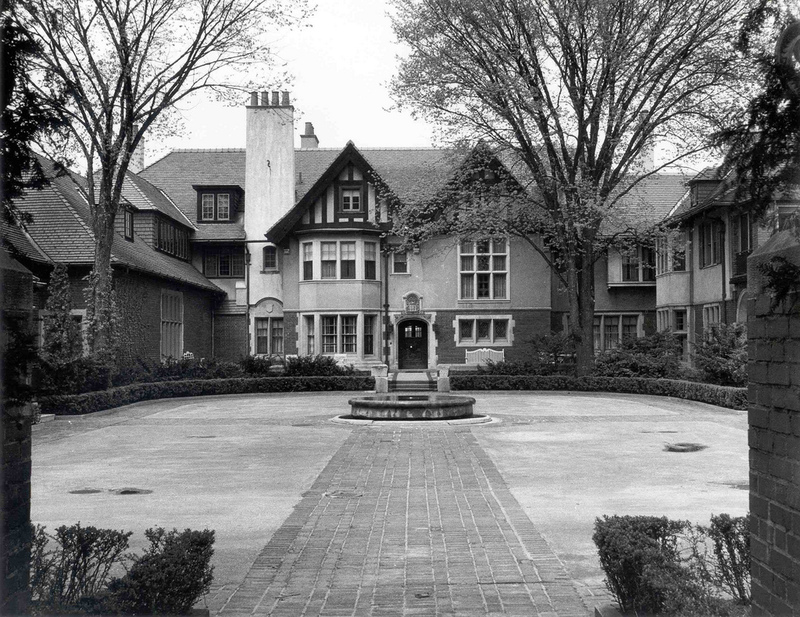 While attending Kingswood School in Bloomfield Hills, Michigan, Florence met the Saarinen family with whom she became close friends. She was fascinated by the building; word got to Saarinen and son Eero, 7 years her senior and studying architecture at Yale, and soon young Florence was accompanying them on summer pilgrimages to Finland. She studied under Eliel Saarinen and developing her interest in texture and color through her friendship with Loja Saarinen who supervised the school’s weaving studio. 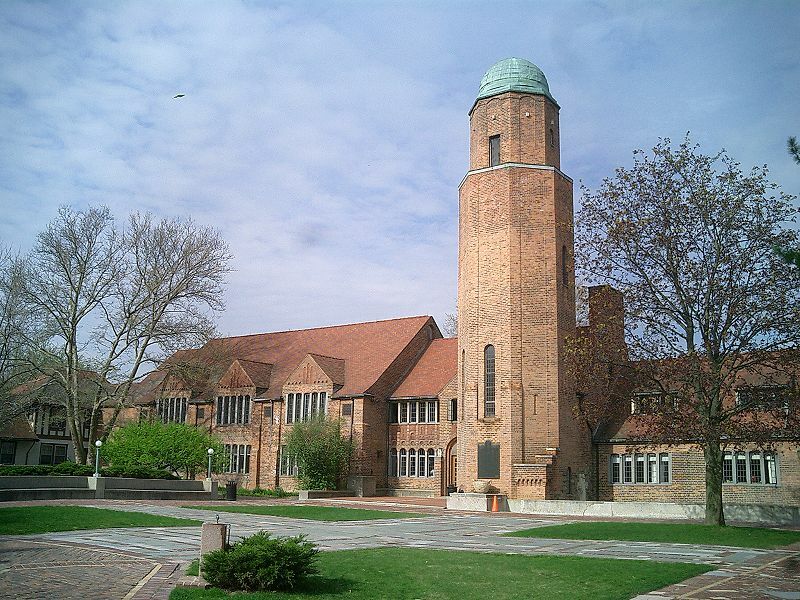 Kingswood is on the same campus grounds as Cranbrook in Bloomfield Hills Michigan. At Kingswood, she designed her first house, conceptually complete in every detail, at age 14. Cranbrook presented a holistic approach to design that Florence carried forth with her. 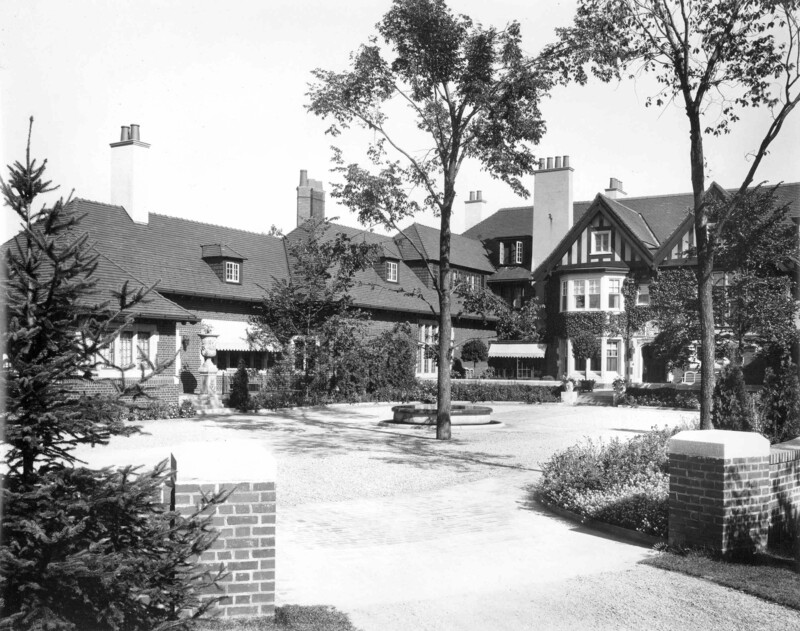 The major components of Cranbrook were designed and built during the years between 1926 and 1943. 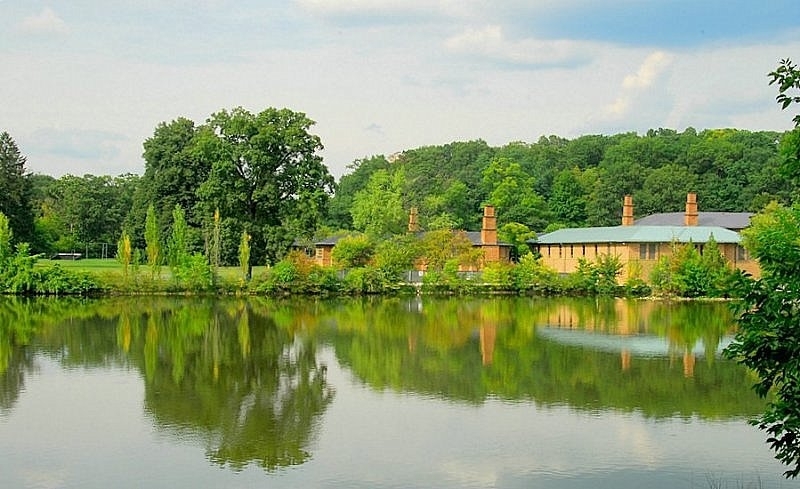 Cranbrook had its beginnings in 1904, when George Gough Booth, publisher of the Detroit News, and his wife, Ellen Warren Scripps Booth, bought a large farm in the rolling countryside of Bloomfield Hills and named it after the English village of Cranbrook, the Booth family ancestral home. Taking up residence in 1907, the Booths gradually transformed their farm estate into a remarkable cultural and educational complex consisting of their home, Cranbrook House; the Meeting House, which was expanded into the elementary Brookside School; Christ Church, Cranbrook; Cranbrook School for boys; Cranbrook Academy of Art; Kingswood School for girls; and Cranbrook Institute of Science. 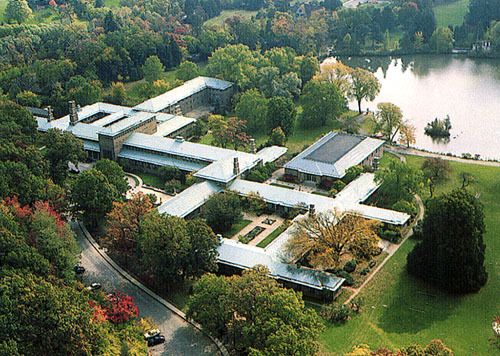 A superb integration of architectural and landscape design elements, the Cranbrook complex represents a unique masterpiece in the history of American architecture. It embodies the belief shared by its founder, George G. Booth, and its principal architect, Eliel Saarinen, that art should permeate every aspect of life. 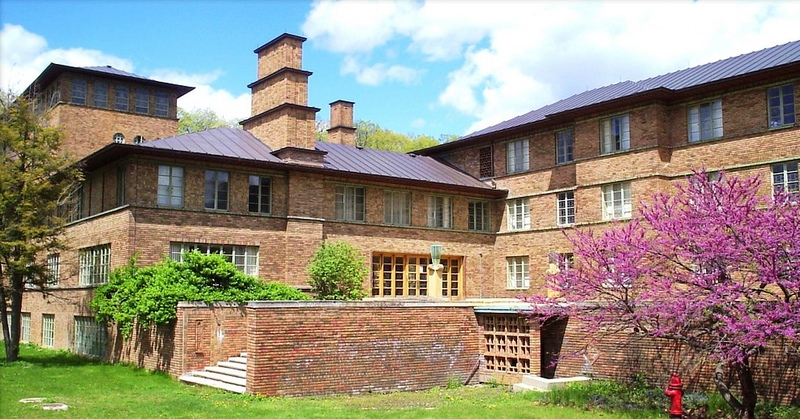 In 1925, George Booth began to collaborate with architect Eliel Saarinen to develop plans for other educational institutions on the Cranbrook campus. 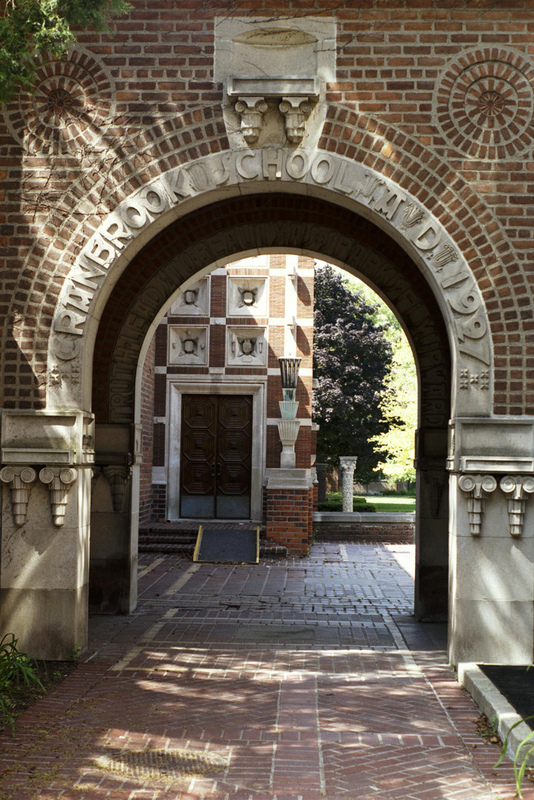 The first project Saarinen undertook for the Cranbrook Foundation established by the Booths in 1927 was to build Cranbrook School, which was completed in 1928. 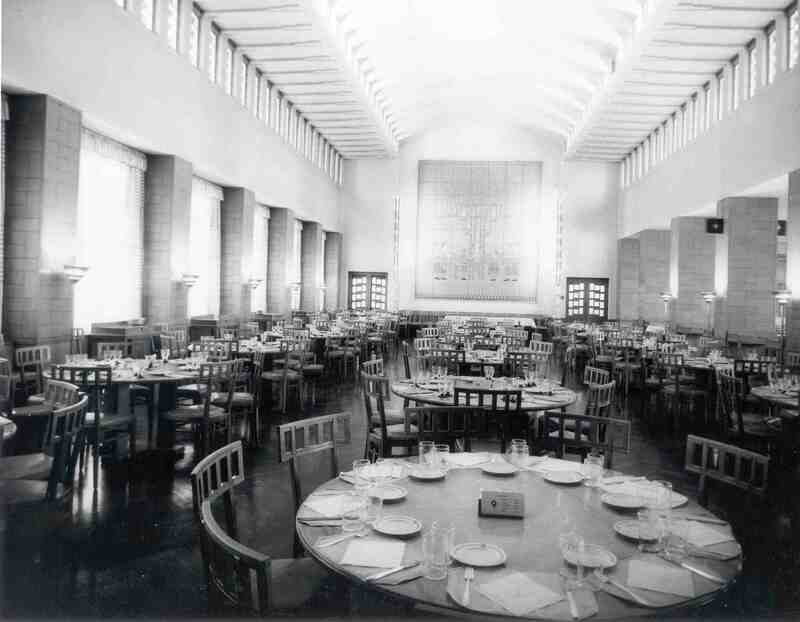 In 1929, Saarinen began to design the girls’ school, Kingswood School Cranbrook, and he collaborated with artisans to create furniture, fabrics and other decorative elements for the schools. 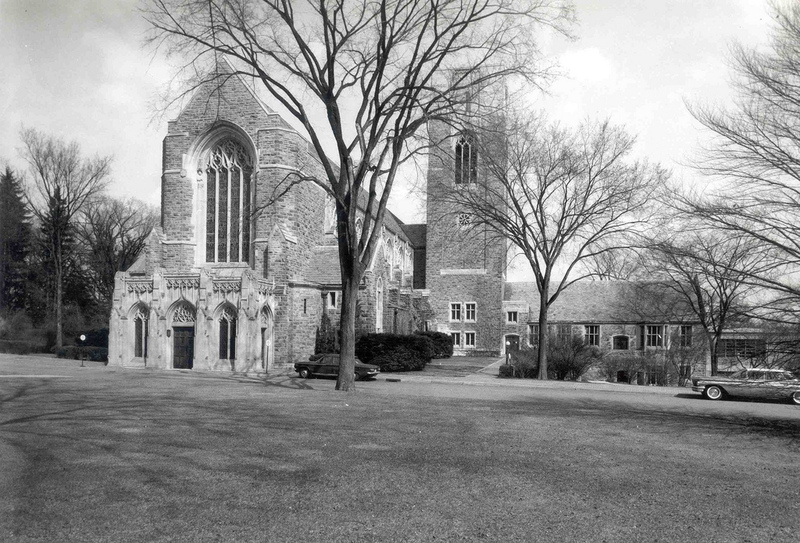 Kingswood school opened to students in 1931. 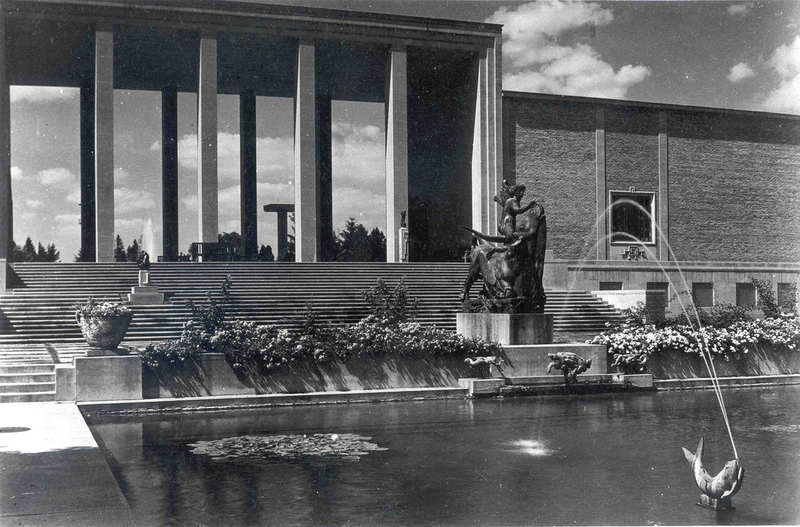 Eliel Saarinen encouraged Florence to attend Cranbrook Academy of Art before finishing her studies in architecture. She spent the next two years at Cranbrook working closely with advanced students and artists such as the Saarinens and Carl Milles, and gaining experience in all aspects of design. 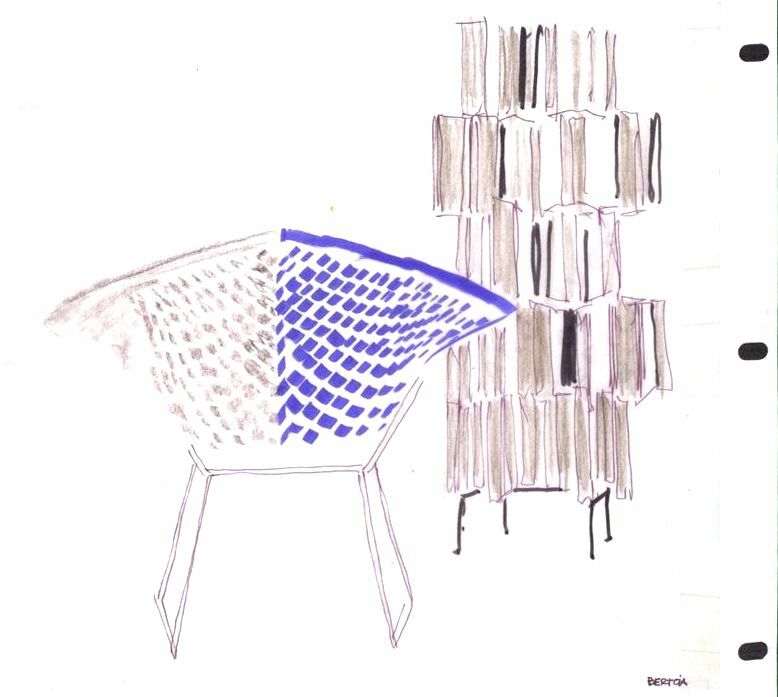 There, she met and worked with many of the designers, Ray and Charles Eames, Harry Bertoia for example, whose furniture and fabric designs she would later commission for her total design packages at Knoll Associates. She associated with many of the Cranbrook students, including Eero Saarinen, Ralph Rapson and Harry Bertoia, whom she later recruited to design for Knoll Associates during the ’40s and ’50s. 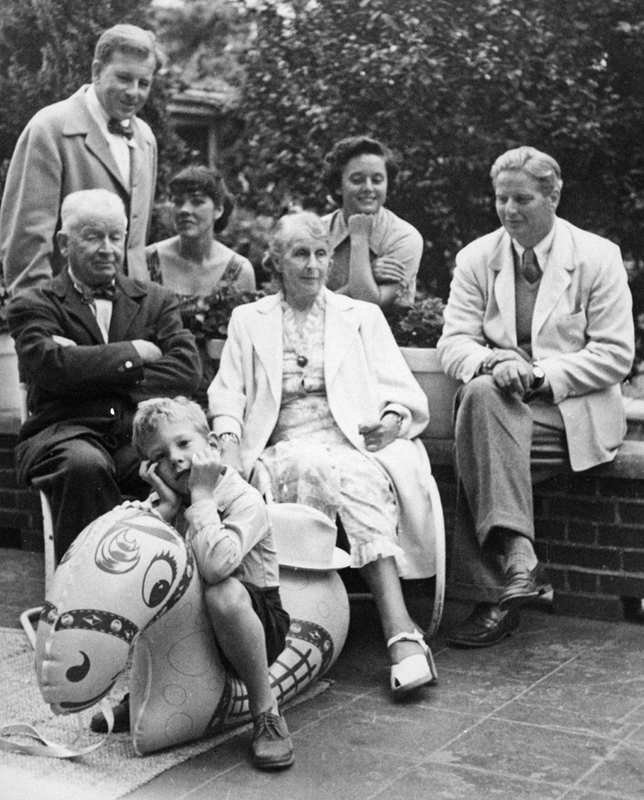 Warmly embraced by the Saarinen family, Florence vacationed with them in Finland, enjoyed the company of their accomplished friends, and formed a very close relationship with Eliel’s son, Eero. 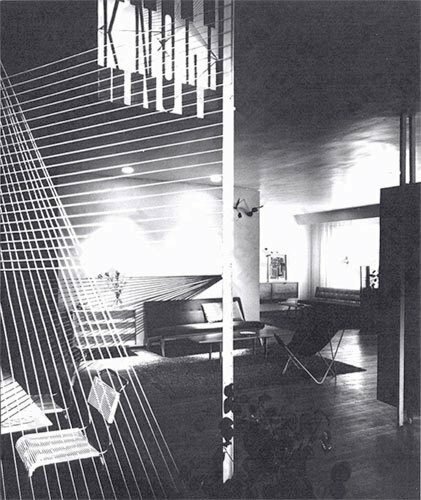 Knoll Bassett then studied for two years at the Architectural Association in London, spending summers with the Saarinens in Europe. (Later, in 1948, she secured the rights to his classic Barcelona collection for Knoll). The connections she made and the skills she developed while at Cranbrook were the foundations of Florence Schust’s incredible design education and pioneering career. 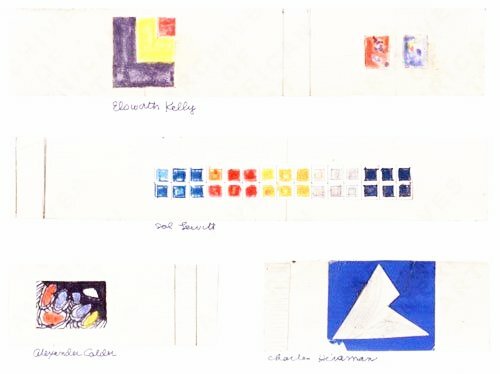 She briefly worked with leaders of the Bauhaus movement, including Walter Gropius,Marcel Breuer, and the American modernist, Wallace K. Harrison. 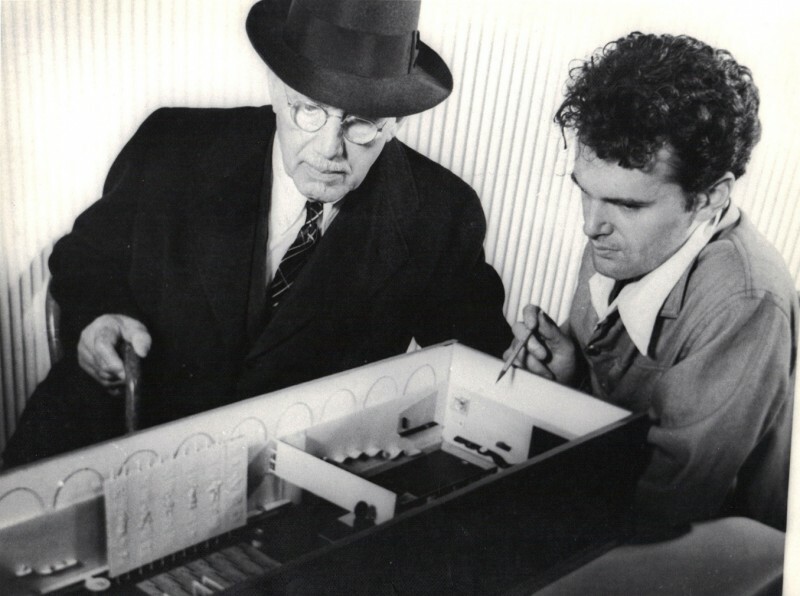 In 1938, Hans Knoll founded his furniture company by that name in New York. Hans Knoll asked her to design an office for the U.S. Secretary of War. She began working for the Hans G. Knoll Furniture Company. 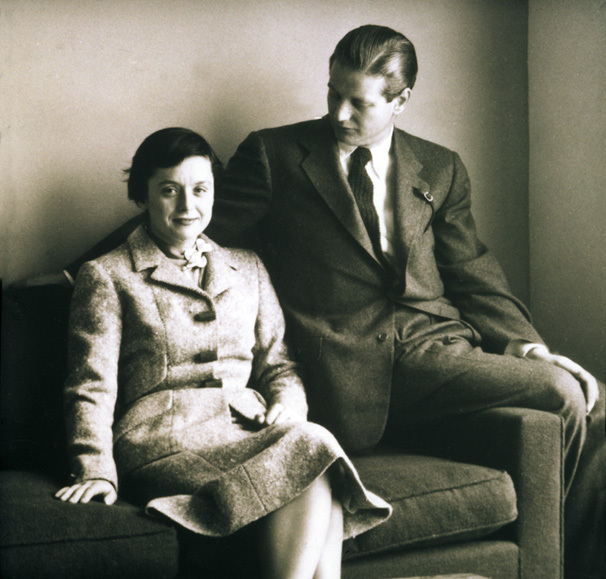 In 1943 she began working for him in her spare time as an interior space planner and designer. 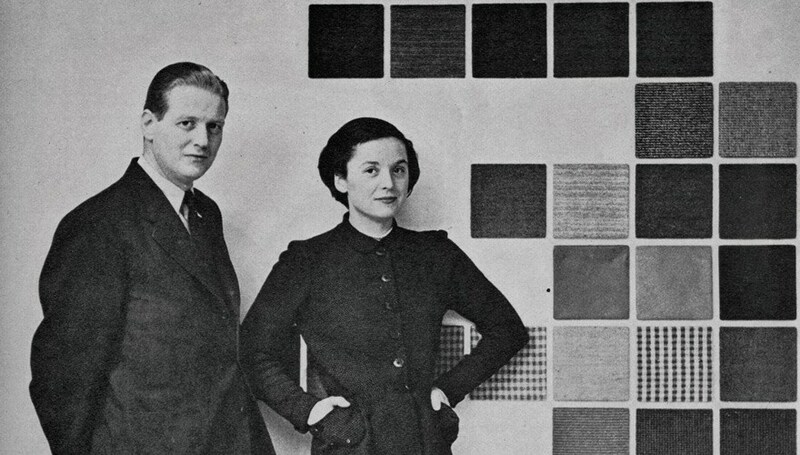 In 1943, Florence Schust convinced Hans she could help bring in business to his company even in America’s wartime economy by expanding into interior design by working with architects. With her architectural background and design flair, she succeeded. 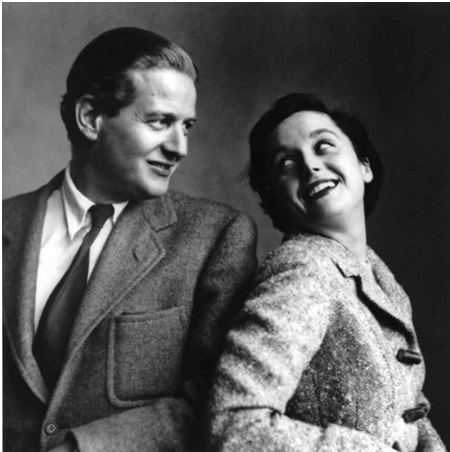 They married in 1946, she became a full business partner and together they founded Knoll Associates. 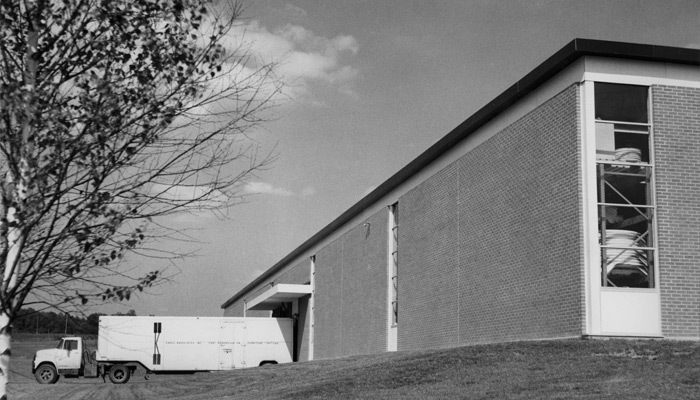 In 1950, Hans moved the Knoll base of operations from New York City to Pennsylvania. A new furniture factory was established in Pennsylvania and dealers in Knoll’s furniture were carefully added over the next several years. 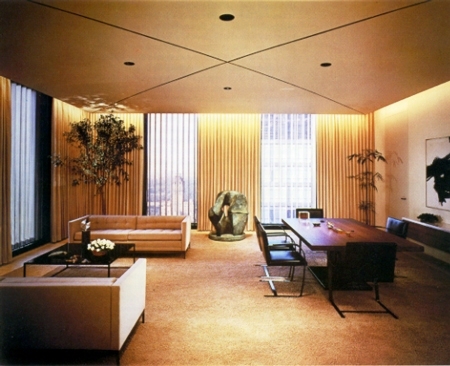 Florence Knoll felt architects should contribute their design ability to furniture as well. Some of these furniture designs would become design icons of the 20th century and have remained in the Knoll line for decades due to their timeless design. Florence Knoll herself designed chairs, sofas, tables and casegoods during the 1950s, many of which remain in the Knoll line to this day. In 1958 she married Harry Hood Bassett. 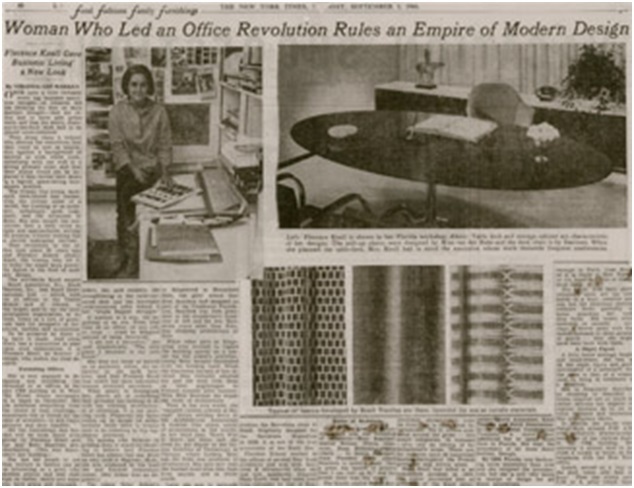 She founded Knoll textiles and designed the company’s regional showrooms. 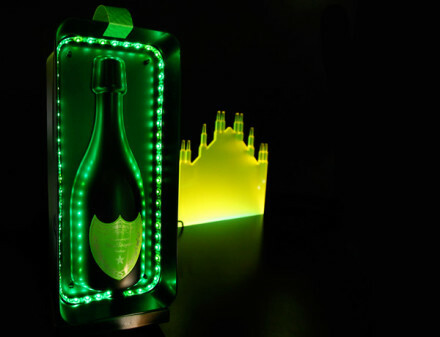 in 2004, she came out of retirement to design an exhibition of her own work for the Philadelphia Museum of Art in 2004. For her extraordinary contributions to architecture and design, Florence Knoll was accorded the prestigious National Medal of Arts in 2002. Now 96, Florence Knoll Bassett is revered by generations of architects, designers, students and collectors of Modern furniture. 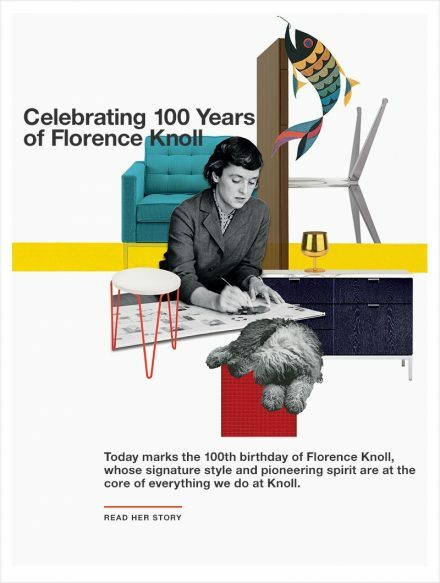 Knoll International remains a highly respected manufacturer of furniture and textiles, still producing the designs of Florence Knoll. 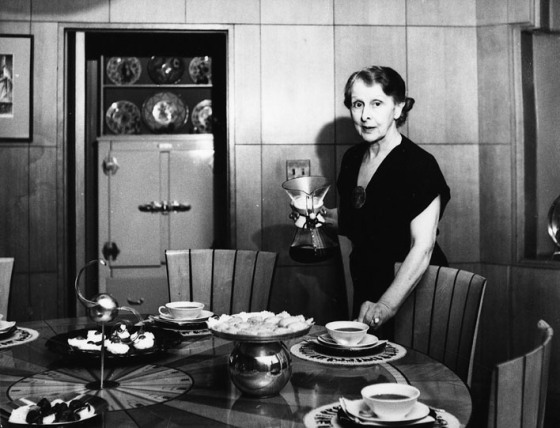 As director of the Knoll Planning Unit, Knoll Bassett established herself as one of the most important and influential interior planners and designers of the second half of the twentieth century. 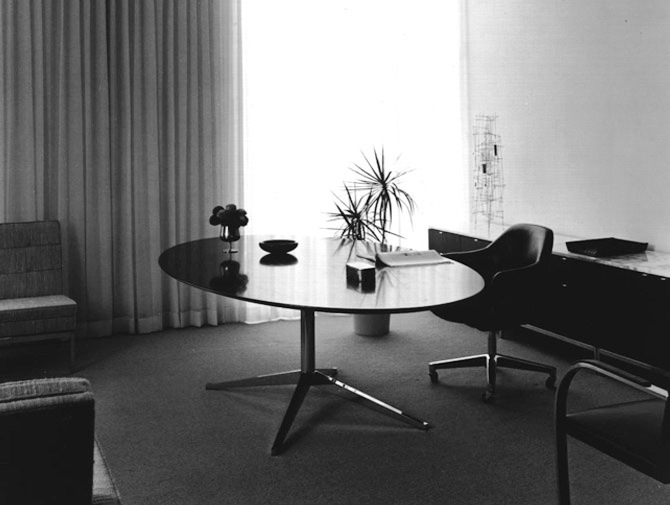 Florence Knoll Bassett brought about a revolution in the American office. Heavy, dark woods and closed off spaces were transformed into modern, bright, and open workspaces under her skillful guidance. An architect, designer, and proponent of humanized modernism, she changed the way we work, and produced some of the 20th century’s most iconic furniture pieces. Believing that intelligent design “strikes at the root of living requirements and changing habits,” she established the practice of working closely with the corporate sector to determine the needs of the people who would actually use the spaces that her company designed. 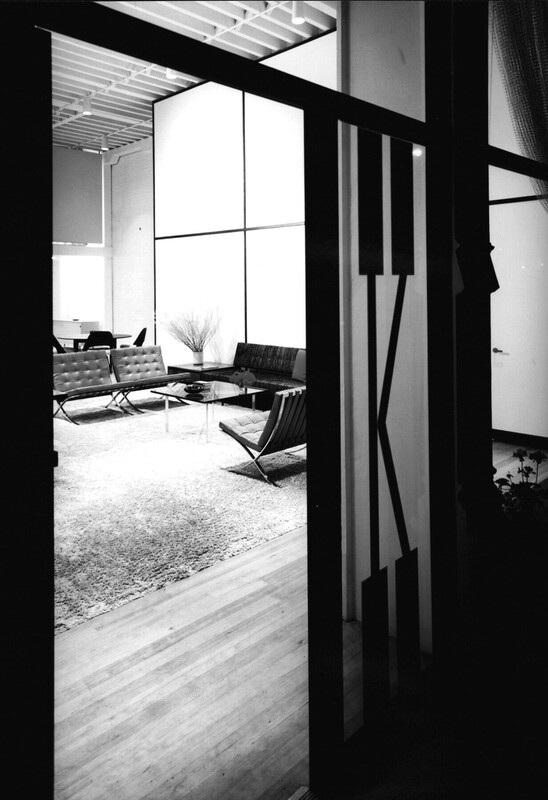 Her connections with leading contemporary architects and designers, and the company’s commitment to crediting designers by name and paying them royalties, laid the foundations for the strong working relationships upon which the commercial success of Knoll Associates was built. While Knoll Bassett oversaw the creative process of the Planning Unit’s operations in its entirety, she was also directly responsible for many of the individual elements used in the Unit’s projects. 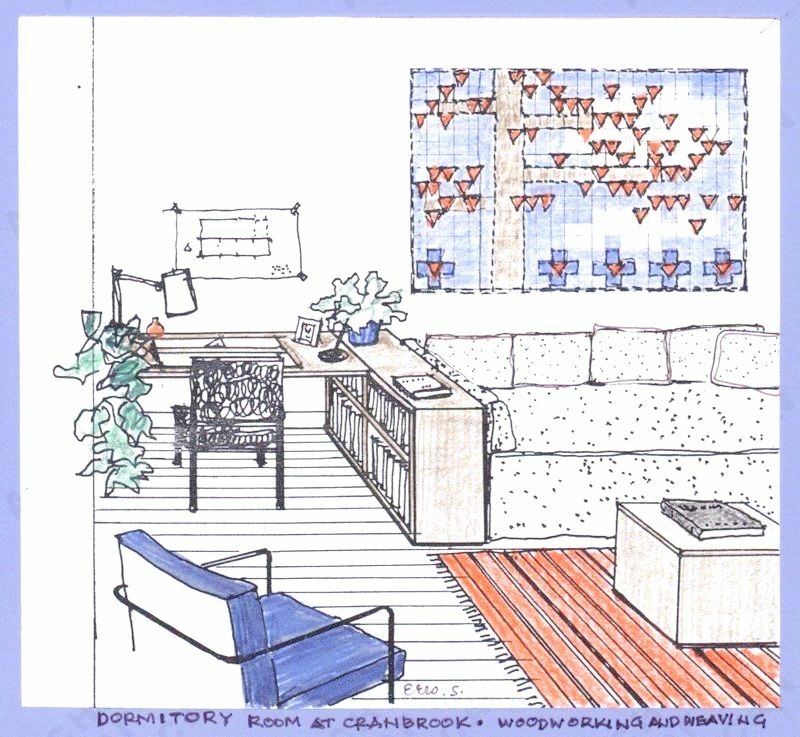 During the war years, she worked with her designers to overcome the scarcity of materials, establishing Knoll Textiles in response to the dearth of available fabrics and textile colors, and developing the company’s hallmark style of spare clean lines and vibrant colors in a functional, comfortable, and aesthetically appealing space. 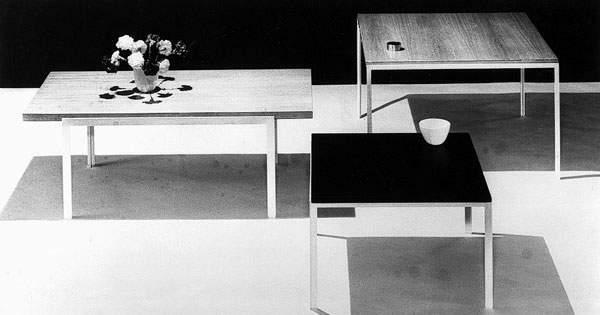 Finding that much of the “fill-in” furniture, primarily cabinetry, that she envisaged in many of her plans was not available, Knoll Bassett designed the pieces herself. 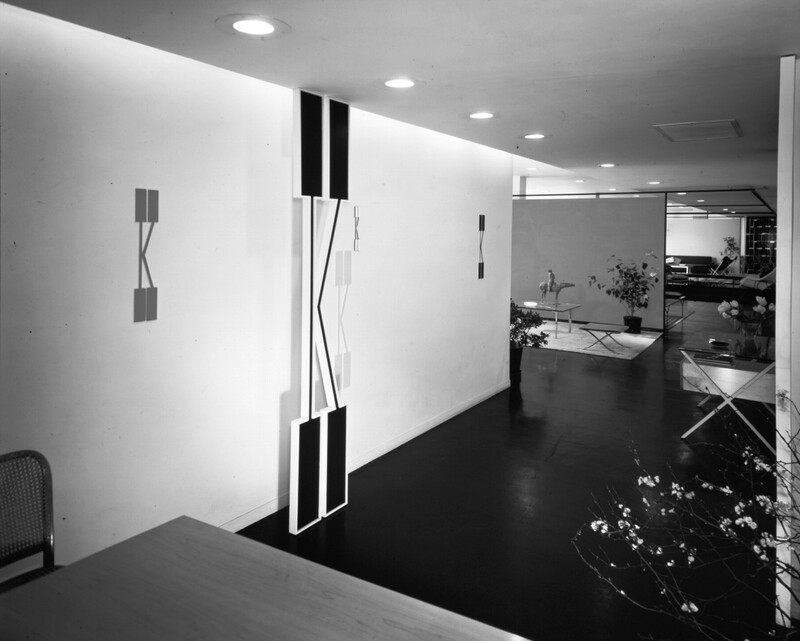 She used the Knoll showrooms as “experimental laboratories” to convince clients to use modern ideas and materials, showcasing and putting into production the classic designs of people such as Eero Saarinen, Mies van der Rohe, Jens Risom, Harry Bertoia, Isamu Noguchi, and Marcel Breuer. After the war Knoll Associates expanded to Europe through a series of government contracts which resulted ultimately in the formation of Knoll International. When Hans Knoll died suddenly in an automobile accident in 1955 Florence became president of the company. She married Harry Hood Bassett in 1958 and began to divide her time between New York and Florida. 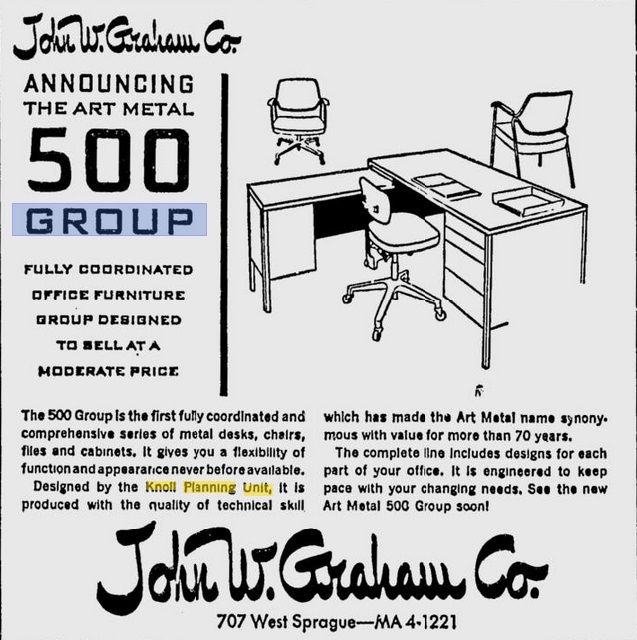 In 1959 she sold her interest in Knoll Associates to Art Metal and retired as President of the company the following year, while continuing to work as a consultant and serving as Design Director. In 1961 she became the first woman to be awarded the Gold Medal for Industrial Design by the American Institute of Architects, one of many awards received over the course of her career. 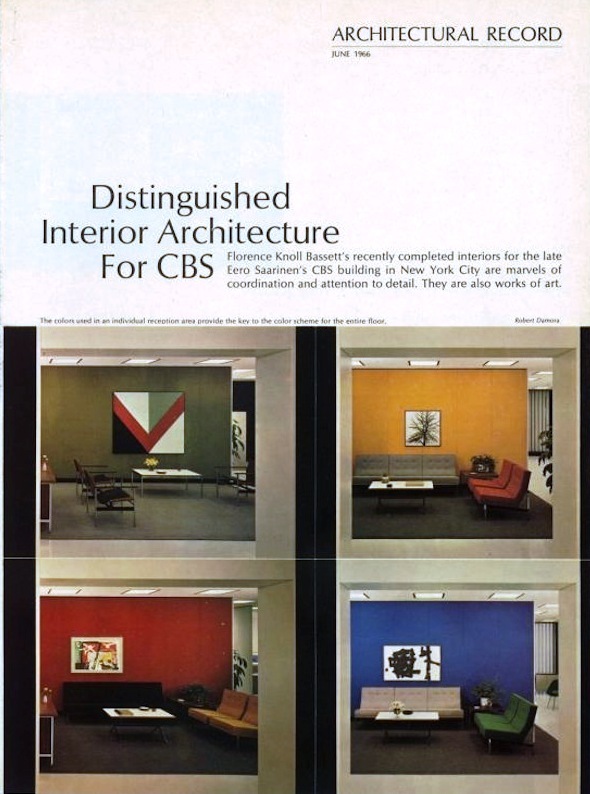 In 1965 she resigned from Knoll Associates entirely after completing the interior design for the CBS headquarters in New York. Following her retirement Knoll Bassett devoted more time to private commissions and other interests such as her campaign against billboards in Miami in the mid 1980s. She spent summers in Vermont and winters in Florida with her husband, until his death in 1991. In July 2001, Metropolis magazine published a rare interview with Knoll Bassett in which she reflects upon the life she so skillfully documented in the extraordinary gift of her archival papers to the Archives of American Art. Hans Knoll founded his eponymous company in New York in 1938, just one year after immigrating from Germany. He must already have had big dreams, for he posted a sign saying “Factory No. 1” outside the single second-story room he rented on East 72nd Street. 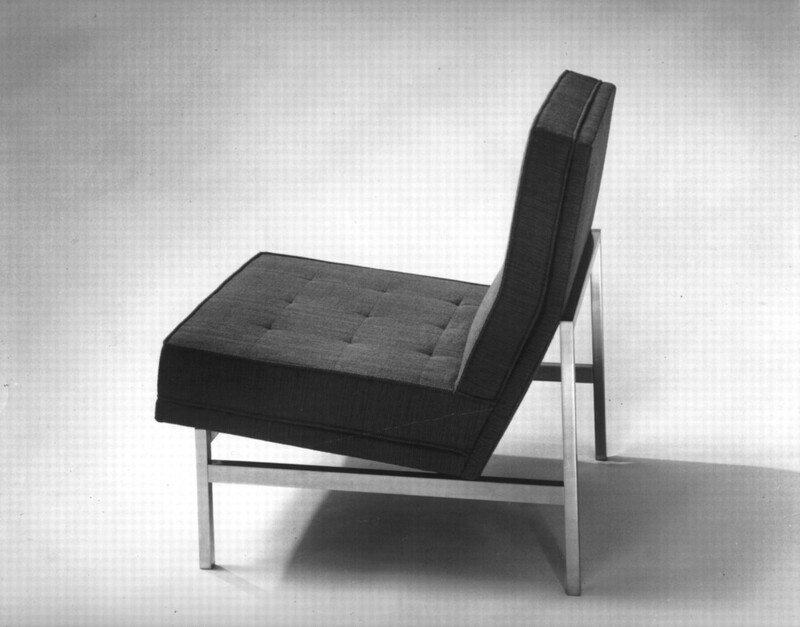 Hans’s father was the pioneering German manufacturer of modern furniture, Walter. Establishing the H.G. 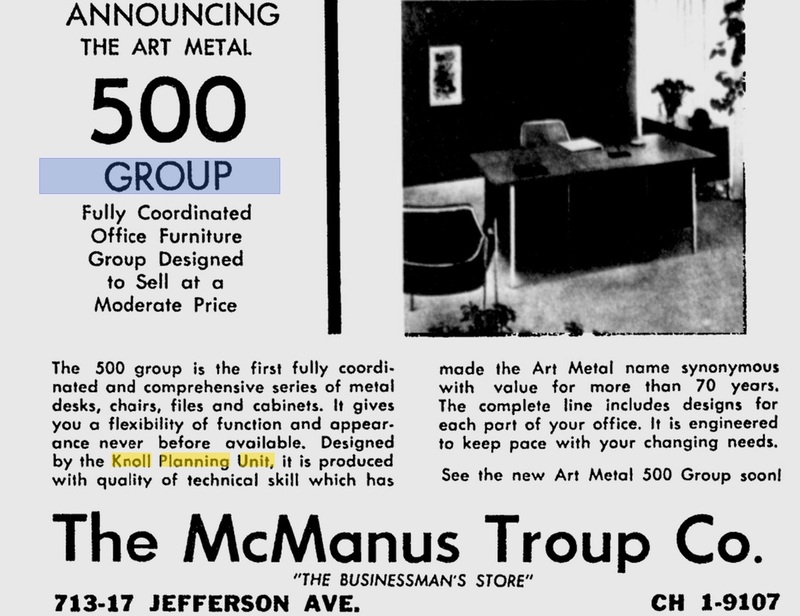 Knoll Furniture Company was Hans’s declaration of independence. Hans Knoll, born and raised in Stuttgart, had been educated in England and Switzerland during an era of aesthetic and social revolution. An admirer of the Bauhaus, he was familiar with its giants of design and architecture, including Walter Gropius, Marcel Breuer, and Ludwig Mies van der Rohe. 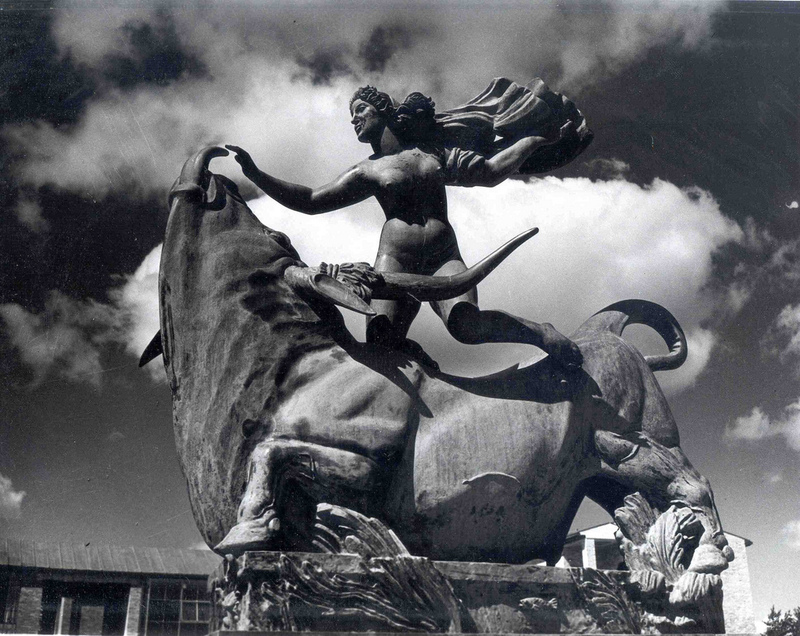 Stuttgart, one of the breeding grounds for the crop of new ideas generated in during the 1920s, hosted many exhibitions of the Deutscher Werkbund, a government organization that promoted German design and architecture. Such were the influences on young Hans Knoll. By the time he crossed the Atlantic at age 24, he had formulated the credo that would distinguish his company: Modern architects need modern furniture for their modern buildings. Many of those modern architects had left Germany before Knoll. In 1933, the Nazis had shut down the Bauhaus, a hothouse of ideas that nurtured some of the 20th century’s greatest architects, designers, and artists. Mies Van der Rohe, Breuer, and Gropius, among others, fled to the United States, transplanting the philosophies of architecture that have evolved into American design culture as we know it. 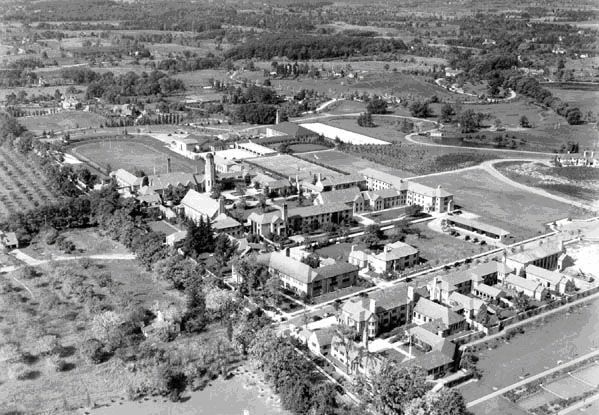 In 1932, the year before the Nazis sparked the exodus of many of Germany’s great young designers, George W. Booth established the Academy of Art at Cranbrook, in Bloomfield Hills, Michigan. He selected Eliel Saarinen, a Finnish emigre and noted modern architect, as president. 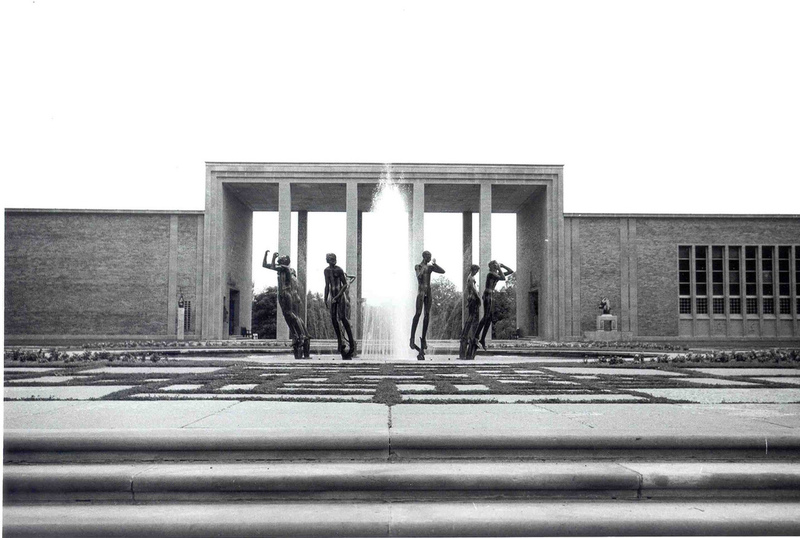 Cranbrook, as the academy came to be known, had much in common with the Bauhaus. Both were schools and residential communities for practicing artists, founded on the utopian ideal that aesthetic values would tame the chaos of industrial society. Each was committed to an underlying competence in craft and craftsmanship. 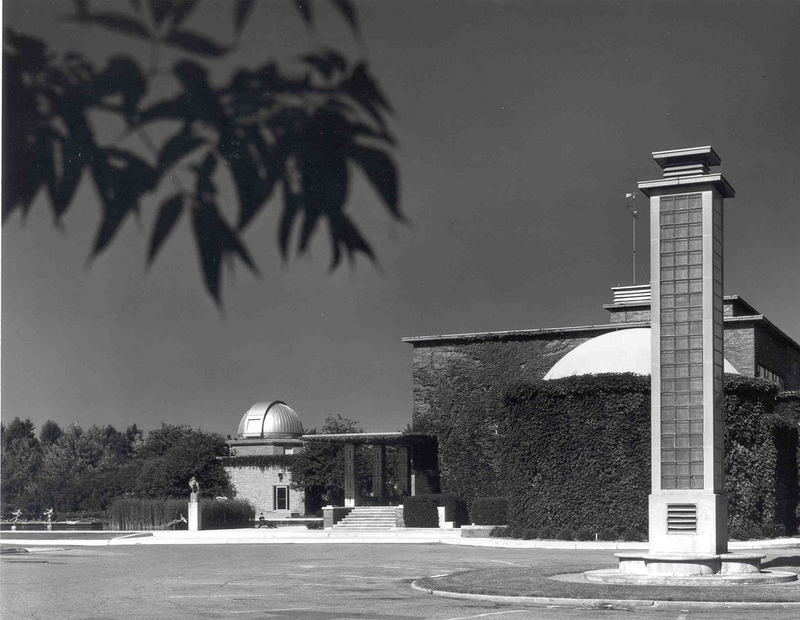 Cranbrook’s faculty and graduates, like those of the Bauhaus, had a major impact on 20th century art, design and architecture, and many later became associated with the Knoll company. 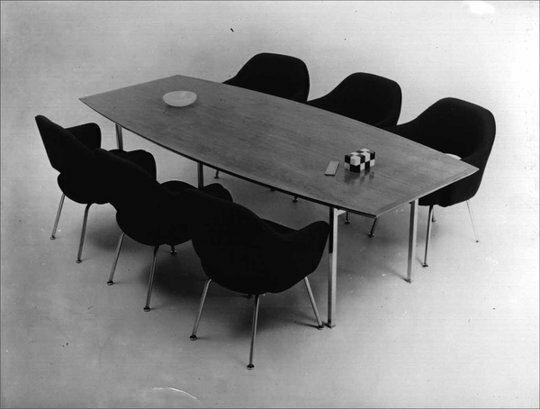 America’s isolation from the modern movement began to dissipate in 1940 when two young American instructors from Cranbrook – Eero Saarinen, Eliel’s son, and Charles Eames-won an international competition for furniture design conducted by New York’s Museum of Modern Art. Since it was unprecedented for Americans to achieve honors in the field of furniture design, Eames and Saarinen and their furniture prototypes began to change the perception that only Europe produced superior designers. When the post-war building boom erupted in an explosion of homes and office buildings, it was the architects of the Bauhaus who were selected to design corporate America. In the second half of the 20th century the faculty and graduates of both the Bauhaus and Cranbrook helped set the standard for contemporary architecture and design around the world. 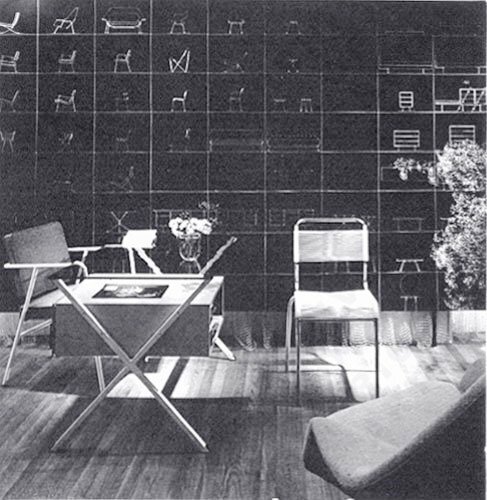 During the early 1940s, Knoll had begun to think about developing a base for manufacturing outside New York City. An excellent business manager, he began investigating eastern Pennsylvania because of its concentrated population of German-Americans and Pennsylvania Dutch. The community had a tradition of meticulous craftsmanship and a potential supply of healthy young laborers returning from the war who no longer wanted to farm. Knoll made his first major investment: a former planing mill in Pennsburg, near Quakertown. 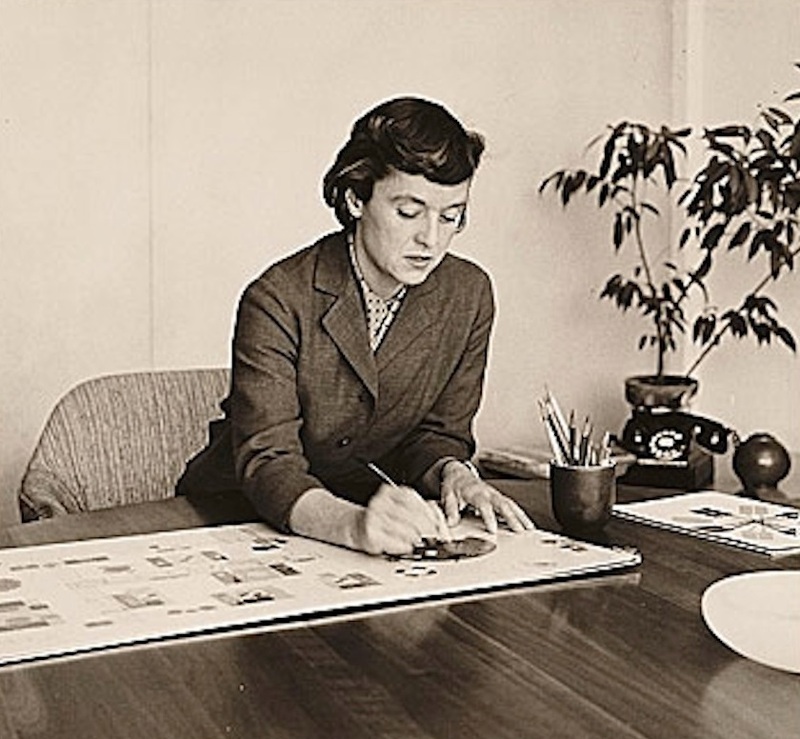 During the war, Knoll had met and hired Florence Schust, a young space planner and designer who later helped Knoll achieve his vision of modern furniture and interiors for modern buildings. As a student at Cranbrook, Schust, had became friends with the Saarinen family and spent summers with them at their home in Hvitrask, Finland. She also toured Europe, visiting the great architectural sites. She later studied at the Architectural Association in London at the suggestion of the great Finnish architect Alvar Aalto, and spent two years there under the influence of Le Corbusier. 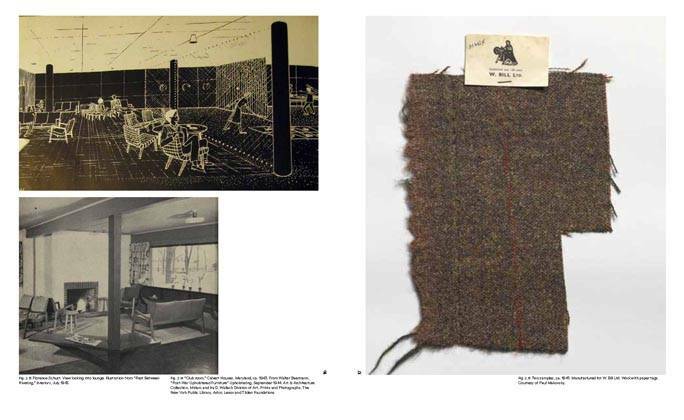 At the outbreak of the war, Schust returned to the U.S., apprenticing with Gropius and Breuer until she entered the Armour Institute (subsequently the Illinois Institute of Technology) to complete her degree. There, Mies van der Rohe, the head of the school of architecture, had a profound effect on her design approach. Schust moved to New York after graduation and worked in several architectural offices where, as the only female, she was assigned the few interiors projects that came along. When Schust joined Knoll’s company, she considered herself an interior designer with “opinions” about furniture-not, strictly speaking, a furniture designer. The two had a difficult time finding work involving contemporary design; when they did, production proved problematic because materials were limited by wartime shortages. Knoll and Schust married in 1946. 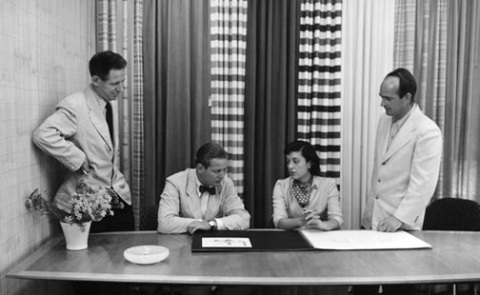 They also formalized their business partnership, which became Knoll Associates Inc.
Florence’s keen eye for design, Hans’s knowledge of furniture manufacturing and marketing, and their limitless energy proved to be a winning combination. 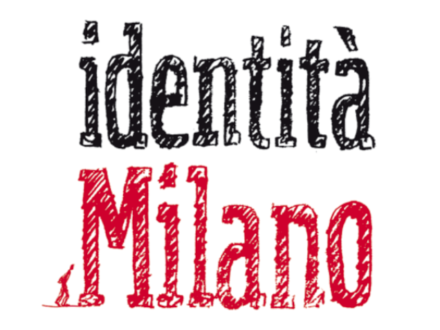 Florence played a critical role in the company’s development. She championed the Bauhaus approach to furniture design: to offer objects that reflected design excellence, technological innovation and mass production. Together, the Knolls searched out and nurtured talented designers. They believed strongly that designers should be credited by name and paid royalties for their designs. Knoll continues that tradition today. 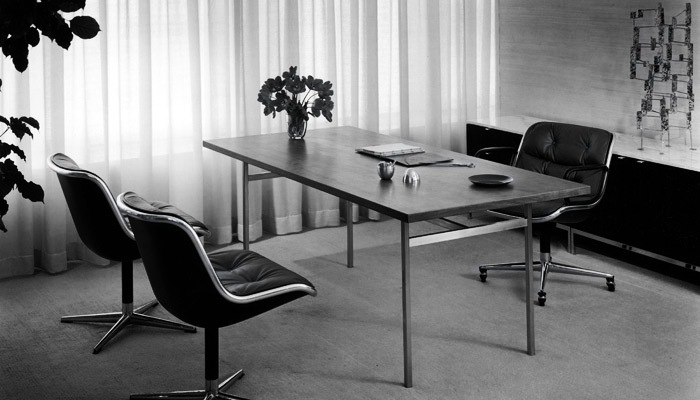 After the death of Hans Knoll in 1955, Florence Knoll took over as president and continued to exert her influence on all aspects of design, while leaving business matters to others. In 1958, she married Harry Hood Bassett, and began dividing her time between New York and Florida. In 1965, she resigned from the company, withdrawing from the industry completely but leaving the company in the hands of those she had trained and inspired. A strong advocate for conserving farmland, the Bassetts donated the development rights to their Vermont farm to the American Farmland Trust. 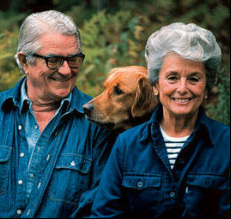 As part-time Vermont residents, Florence and Hood Bassett generously supported facilities at the University of Vermont, including the Flow Cytometry Facility at the UVM College of Medicine and the Proctor Maple Research Center. 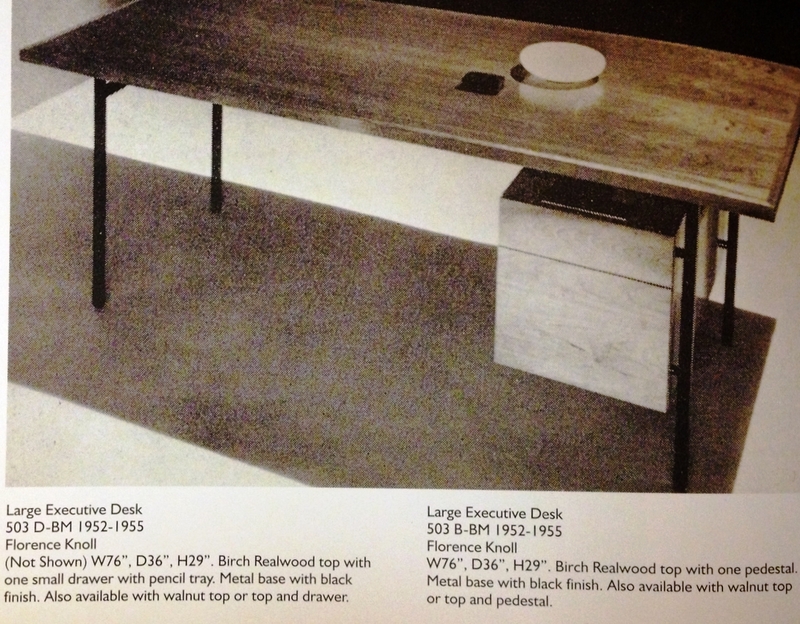 Bassett was inducted into the Interior Design Magazine Hall of Fame in 1985. In 2000, she donated her papers to the Smithsonian Institution’s Archives of American Art. Her career archive – described by Metropolis magazine as “a revelation” – was a work of art in itself. In 2003, her contributions to modern design earned her the honor of the 2002 National Medal of Arts – the highest award given to artists and arts patrons by the United States government. 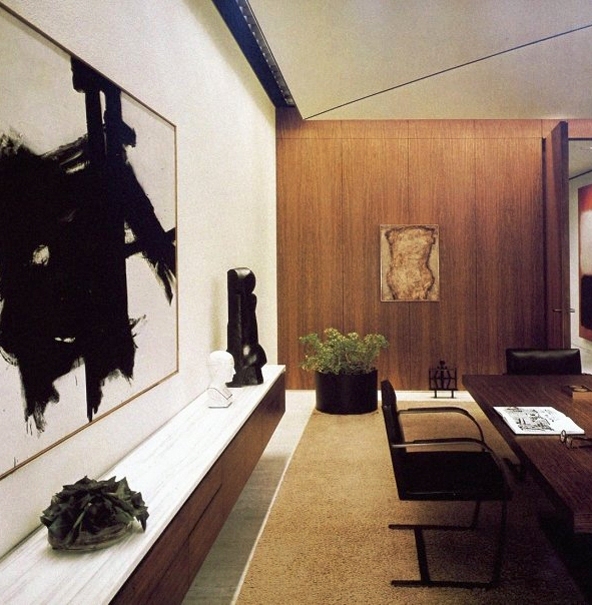 No doubt, Florence Knoll Bassett will continue to inspire innovation in interior design for generations to come. 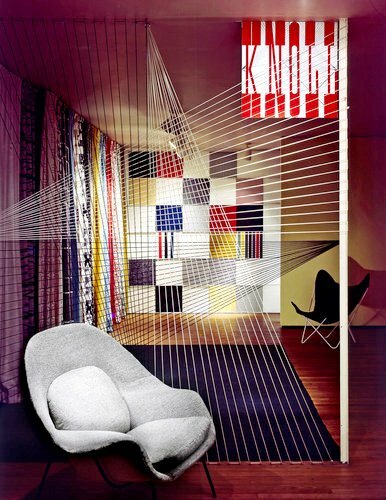 Knoll won four of the Museum of Modern Art’s “Good Design” competitions, and Knoll designs are still displayed today among others on MoMA’s top floor. The University of Miami presented Florence Knoll with an honorary doctorate in architecture in 1995. Florence became the first woman to receive the American Institute of Architects’ Gold Medal for Industrial Design in 1961. Knoll Inc. congratulates Florence Knoll Bassett upon receiving the 2002 Medal of Arts for her contributions to 20th century modern design. She was accorded this prestigious honor in an Oval Office ceremony at the White House on March 6, 2003. 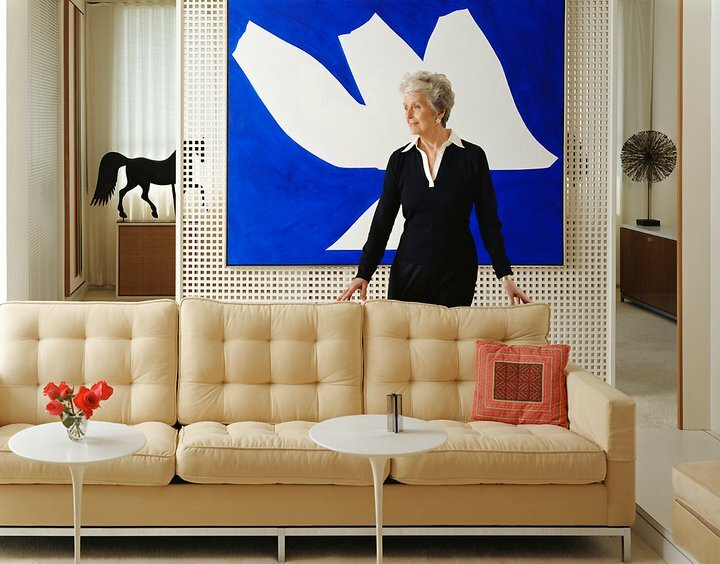 Her vision, pioneering spirit and her commitment to creating furnishing solutions that met the client’s needs brought Knoll to the forefront of modern design, thus creating the legacy that continues today. Florence Knoll’s furniture designs that really stand out. She only designed furniture when the existing pieces in the Knoll collection didn’t meet her needs. 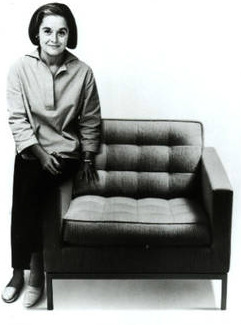 Almost half of the furniture pieces in Knoll’s collection were her designs. The eponymous Executive Collection, comprising 2 and 3 seat sofas, armchair, bench, coffee table and side table, executive table desk and credenza is, in my opinion, her crowning achievement. All perfectly proportioned with sleek silhouettes and geometries, they are true design classics, looking as fresh and modern today as they did when she designed them nearly 60 years ago. 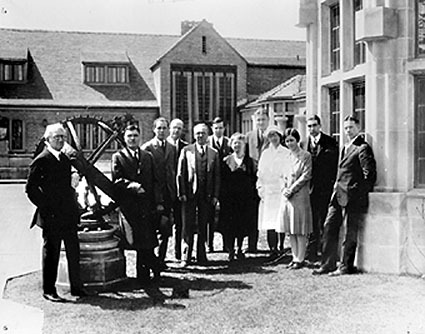 The need she felt had come about because of the Knoll Planning Unit, a unique enterprise for its time, which began when the then Florence Schust became associated with Knoll full time. It did on a regular basis the work she had been doing when she “moonlighted” for Hans. Thinking in terms of architecture, she was trying to relate interior design to the building and the furniture to the interior, as well as to a human scale. 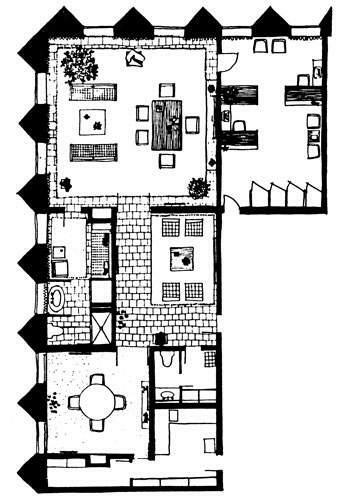 The Knoll Planning Unit was described in the May 1945 issue of Arts and Architectures as “the force which integrates all the various related activities” of the company, with the objective of placing “well designed ‘equipment for living’ within the reach of a large consumer market. Hard as it may seem to remember, the interiors of the early 1940s were still dominated by the “period” and “antique” styles. “Practically all existing mass-produced furniture, “said Interiorsin its articles about Knoll, “caters to a broad public of undiscriminating taste… The commercial product that pours from furniture mills today is as cumbersome as the old-fashioned sleeping car. Nowhere was this more true than in the standard American office, imprisoned in formula and entrenched custom. She wrote, “Prior to World War II, most nonresidential interiors were either designed by the architects for the buildings or were not designed at all. Moer often than not, the building itself was at violent odds with its interior requirements: while the structure might be neo-classical, the functional requirements of the interiors were frequently modern in extreme, so that either the interior spaces would match. Once upon a time virtually every big business executive thought—or whoever did his thinking for him on such matters thought—that his office had to have pale green walls and that his heavy, drawers-to-floor desk had to be placed cater-cornered. 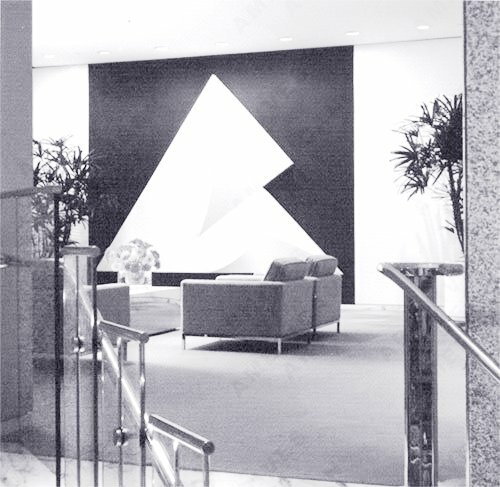 Then along came a woman who showed the executives that they could be just as impressive against a background of neutral or even white walls, sometimes with one wall in a strong primary color, and that their status would not be impaired if they moved their desks to a logical, space-saving foursquare position. The woman was young, dark-eyed, dark-haired and slender, with the clothes sense of a model, the training of an architect, unfailingly good judgment, and the nickname of Schu. She also taught the executives that a desk could be light and approachable, serving its purpose without looking like a carved mahogany fortress. 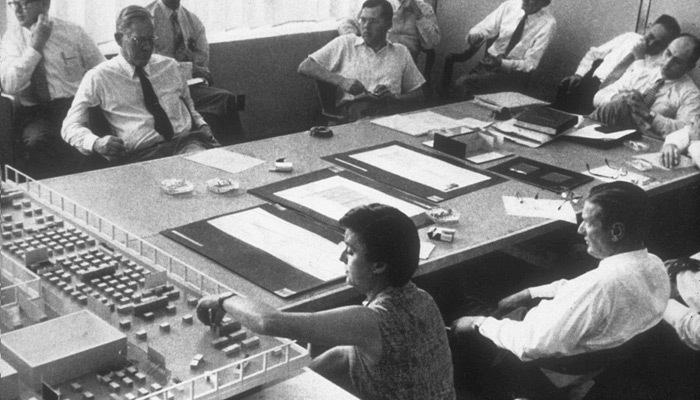 That revolution in the office took place 20 years ago and Florence Schust (Schu) Knoll, the woman who led it, is today the single most powerful figure in the field of modern design. 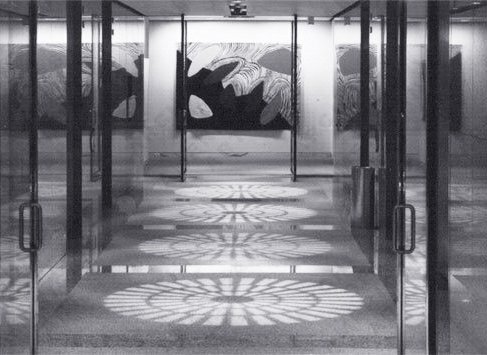 The worldwide Knoll empire — Knoll Associates, Inc., Knoll Textiles, Inc., and Knoll International, Ltd. — which, with its 14 offices in the United States and 21 abroad, is the largest and by far the most prestigious organization of its kind, looms as a sort of promised land for designers of furniture, textiles and accessories. To be accepted by Knoll is to have it made. And while Knoll has a committee to pass upon submissions, it is Florence Knoll, as director of design, who makes the final decision. She is now engaged in designing and furnishing the thousand or so offices in the new CBS building at 51 West 52d Street where occupancy is to begin in December. Her job embraces everything from the choice of wall coverings—sometimes felt or tweed for the sake of acoustics—to ash trays, pictures and door handles. She has led people to see that texture in fabrics can be as interesting as a print (she dislikes prints) and that steel legs on tables, chairs and sofas can have grace and elegance. But Florence Knoll still considers, she said recently, the straightening of the cater-cornered desk and the inevitable cater-cornered table behind it her “single biggest struggle. It marked, in a way, the beginning of an era. From that time on an office—or any other room—could be designed instead of being decorated. “I am not a decorator,she said emphatically in the field. “The only place I decorate is my own house. She does not think of herself as an architect, either. 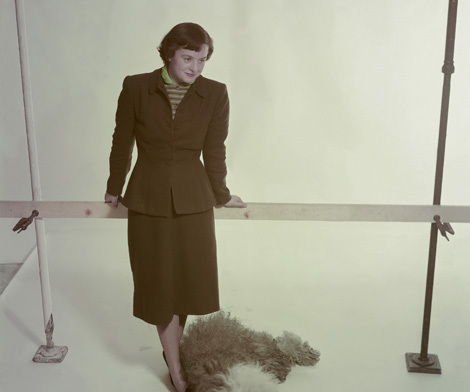 An authority in the field, however, said that Florence Knoll was surely the most successful woman architect anywhere. What seems to distinguish her, above all, is something that probably has nothing to do with her training, architectural or otherwise. It is her unerring taste. Whenever her name comes up in design or architectural fields there is almost sure to be reference to this legendary attribute. 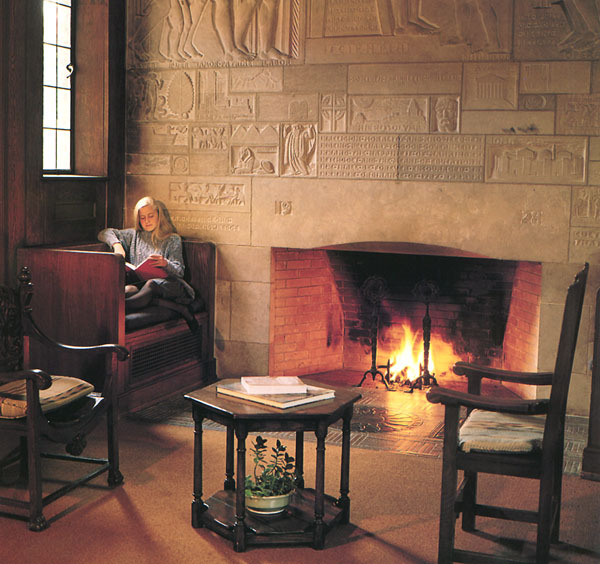 The young ‘Schu’ Schust’s guardian, a banker, sent her to Kingswood in Bloomfield Hills, the girls’ school that Eliel Saarinen had designed as part of the Cranbrook Foundation. Saarinen was then president of the foundation’s Academy of Art and his son, Eero, seven years older than Schu, was studying architecture at Yale. 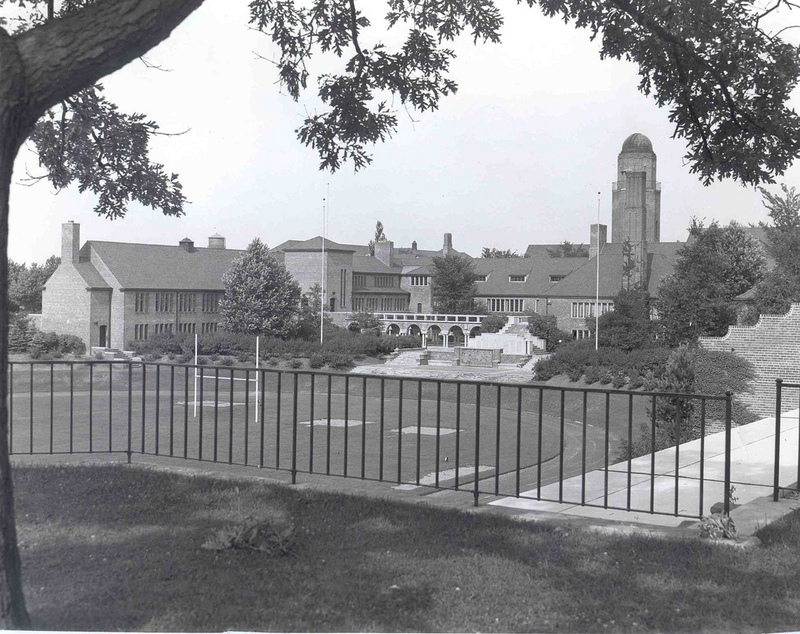 While other girls in Kingswood were inclined to regard the building merely as a center for the school’s activities, young Schu became fascinated with the building itself. When the Saarinens learned of this interest they virtually adopted her and she went with them on their pilgrimages to Finland summer after summer. 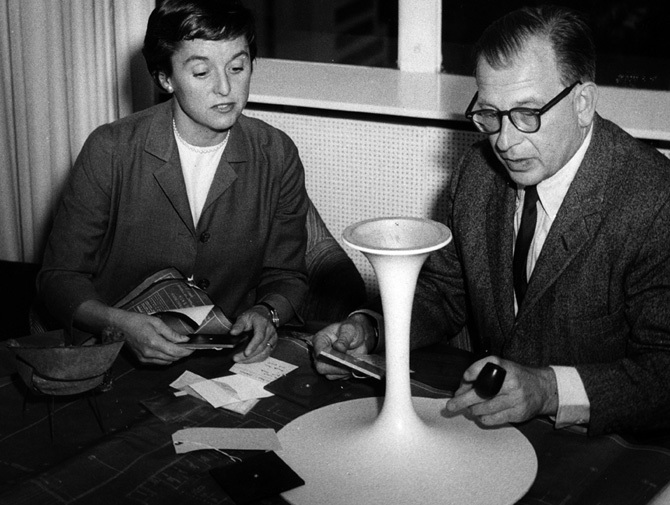 With Eliel Saarinen she began the study of architecture. Then, in her own words, she “sampled various schools in Europe before settling down at the Architectural Association in London (the oldest school of architecture in the world). 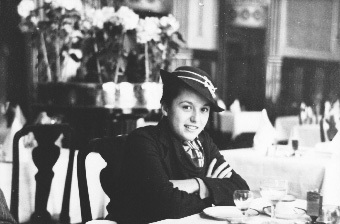 In her third year, World War II drove her home and she went for her degree to the Illinois Institute of Technology in Chicago, where Ludwig Mies van der Rohe was professor of architecture. She says now that she learned more from him than from anyone, and in fewer words. When he and Florence Schust were married in 1944, she entered the concern as a partner and set up the Knoll Planning Unite to handle the company’s interior—designing operations, heading the unit herself. One of their greatest accomplishments was the corralling of architects—Eero Saarinen, Marcel Breuer, Pierre Jeanneret, Hans Bellman, among others—to design furniture. 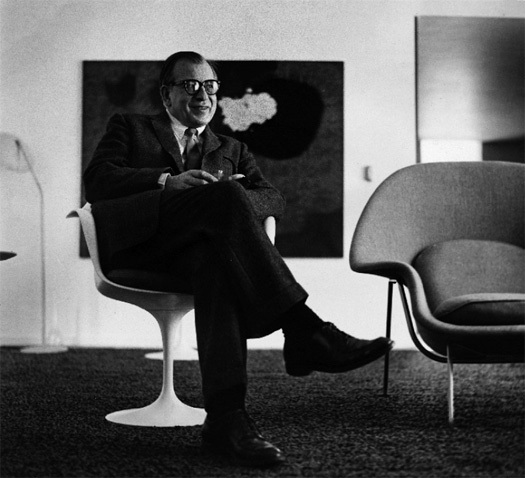 Once Florence Knoll asked Saarinen to make a chair “like a great big basket of pillows that I can curl up in,and his womb chair was the result. 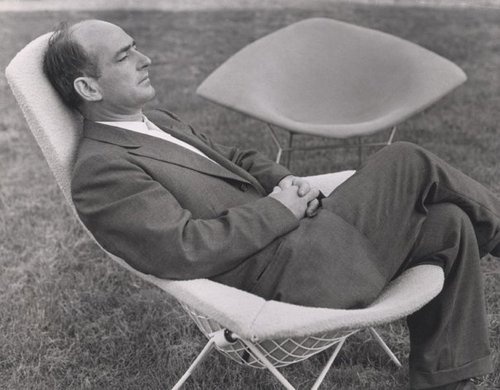 The Knolls staked Harry Bertoia, the sculptor, to two years in a studio barn in Pennsylvania, to see if, after his work with metals, he could turn out furniture. His wire chairs were the answer. The textile division was established. 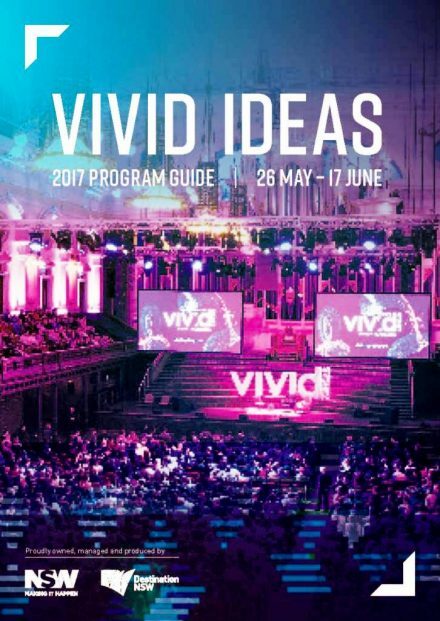 And a design development unit was set up to give would-be designers a chance to show what they could do. 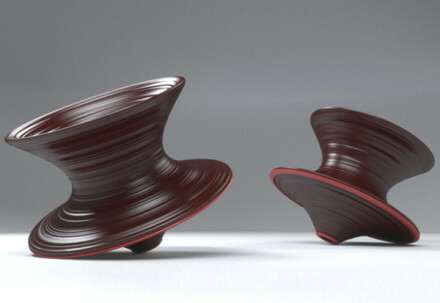 From this cradle of design have come such creations as the petal table by Richard Schultz. 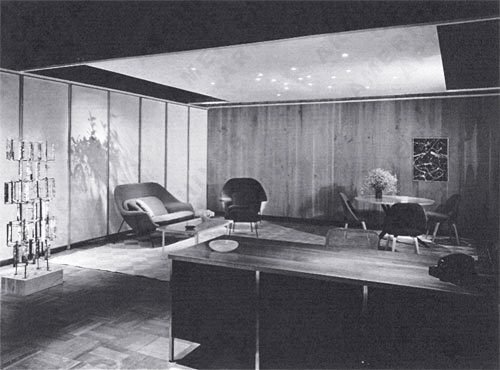 When the Knolls were asked by the State Department to produce furniture for American personnel abroad, they went on from that to form Knoll International. The 21 offices scattered around the globe—five major companies, 16 licensees—give only an inkling of International’s scope. There are, for instance, some 30 franchised dealers throughout the French provinces and Africa alone. Hans Knoll was killed in an automobile accident in 1955. His widow succeeded him as president of the Knoll enterprises. The following year she brought out the Saarinen pedestal tables and chair. 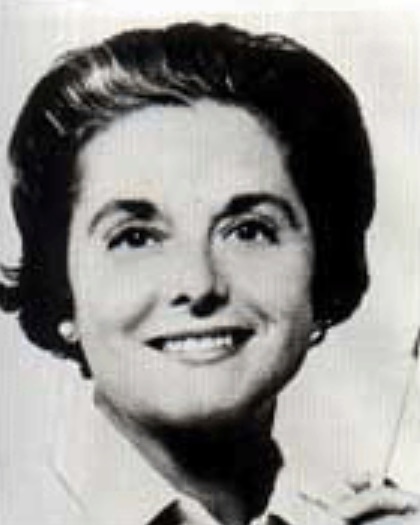 In 1957, among other projects she took on the job of doing the executive offices of the First National Bank in Miami, and the next year she was married to Harry Hood Bassett, an officer of the bank (he is now president) and a Florida cattle rancher. He was exactly her age and, like herself, had been born in Michigan. When she had been married a year she sold the Knoll companies—Knoll Associates, Knoll Textiles and Knoll International—to Art Metal Construction Company, a move that permitted her to spend more time in Florida. She kept the presidency of all three Knoll entities, though. 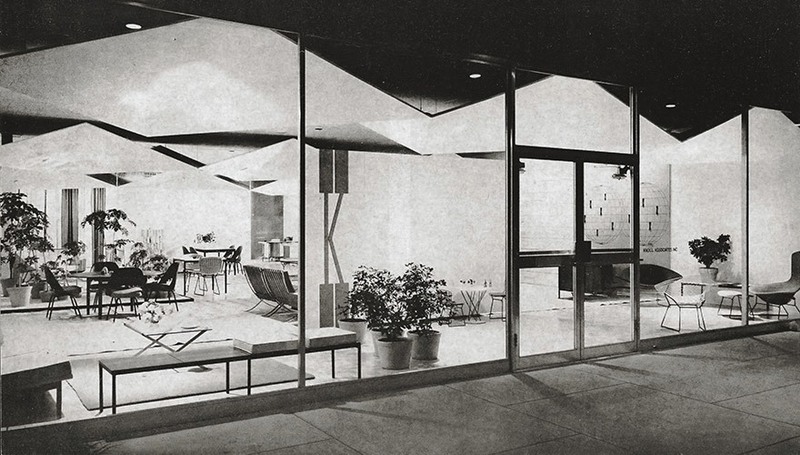 By 1960 Florida was beckoning more insistently than ever and she resigned the presidencies, but she is still very much in charge of design for all Knoll enterprises. 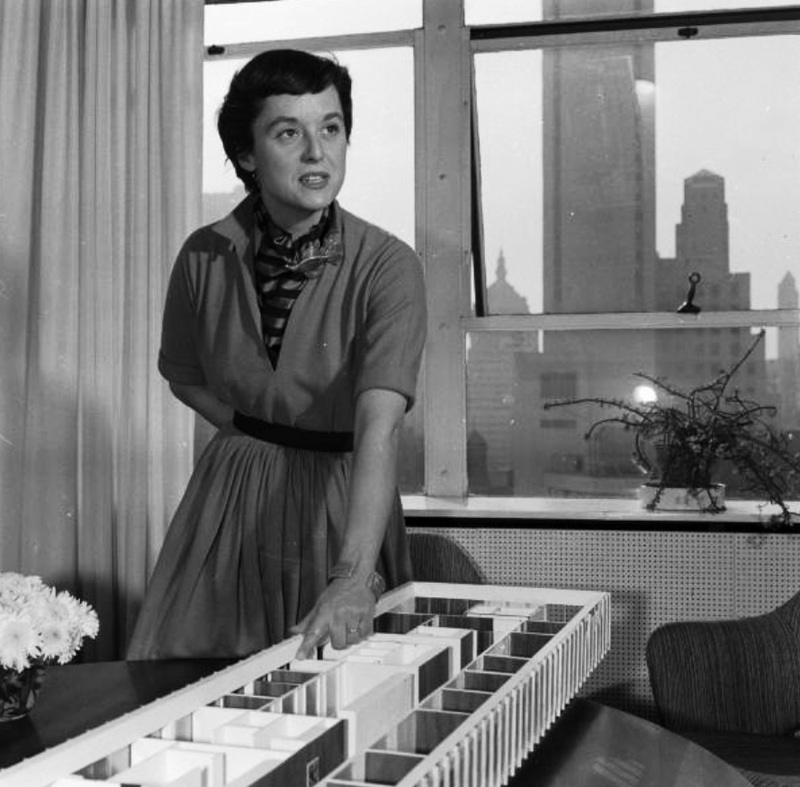 Today Florence Knoll Bassett leads the kind of life that many women might dream of, if they could dream big enough and were not allergic to work. She and her husband live on Sunset Island, off Miami, where there is a studio workshop on the grounds for her. They also have an apartment in New York, at 200 East 66th Street, and are looking for a place in Vermont. Florence Knoll’s clothes are either custom-made—Balenciaga in Paris, Joan Morse of A la Carte in New York—or are jeans or Lillies or things from Jax. Her hands, with their short, unpainted nails, are the used hands of a busy, creative person, but the enormous emerald solitaire looks perfectly at home guarding her wedding band. She wears other emeralds so casually—earrings, a flower spray with diamonds fastened to three strands of pearls—that she might have been born with them. A little below average height and small-boned, she has, at 48, the slight figure and quick movements of a schoolgirl, but the poise is that of a woman used to being in command of a situation. She is frequently described as stunning or beautiful—terms inspired not so much by rather delicate but slightly irregular features as by an inward radiance and animation. Her intelligence shows. In Florida, she starts work these days around 8:30 A.M. with miniature, drawn-to-scale mock-ups of the various floors in the CBS building. The morning is almost sure to include a couple of hours on the telephone with the New York office. Lunch, served on a tray by the pool, takes only half an hour. Then she works until 5:30 or 6, after which there are three sets of tennis and a swim with her husband. In New York her days are spent at the Knoll offices and showroom, 320 Park Avenue. (Anyone accompanied by a decorator may visit the showroom). If her husband cannot join her she usually lunches alone. She reads biography or history as she eats. She does not care for fiction, saying, “I’m interested only in things that are real. When I heard last year that Florence Knoll Bassett (“Shu” to her friends and colleagues) had donated her papers to the Smithsonian Institution’s Archives of American Art, I was thrilled.The historian in me was anxious to review the life and work of this legendary interior space planner and designer, who at the pinnacle of her career in 1965 gracefully withdrew from the design world after completing the interiors of the CBS headquarters, in New York. The Knoll archive is a revelation.There are beautifully illustrated letters written to her by Eero Saarinen; photographs and sketches of her most important interior-design projects; the first house plan she did as a student at Kingswood, the girls boarding school at Cranbrook.Bassett has carefully organized all the material in color-coded files, creating special boxes to contain them. Best of all, there are short handwritten anecdotes accompanying many of the photos and sketches.On a photo of Nelson Rockefeller’s desk (he was her first major client), she has circled an odd-looking inkwell.When you flip the photo over and read her explanation, you learn that the inkwell was made by her friend Isamu Noguchi.On the reverse side of a photo of the Knoll Planning Unit office, she writes that staff member Peter Andes called it “Shu U.” because its young designers were being recruited by architectural firms, who had begun to start their own interior-design divisions.Bassett also produced a little illustrated book for the archive laying out her life and work–education, projects, awards, even some details of her personal life. In a rare interview, I talked to Bassett about the archive and her remarkable life–the Cranbrook years, her relationship with the Saarinens, the infiuence of Mies van der Rohe, her breakthroughs in space planning, her favorite projects (such as the Knoll showrooms), the threatened demolition of the Connecticut General building, and even her fight in the 1980s against billboards, an issue that has recently resurfaced. Only Bassett–who absorbed both the warmth and humanity of Eliel Saarinen at Cranbrook and the rigorous purity of Mies–could put together such a perfect archive.Her creative process is refiected in the way she has assembled the collection: organizing, reducing, and clarifying = Mies; personal explanations and handwritten anecdotes = Cranbrook.Although Bassett never formally became a teacher like her mentors Saarinen and Mies, by managing to fit her life and work into one neat package she shows us that her papers are more than just a personal history–they are a lesson in design. It was one thing to get the scoop of my career—an interview with media-shy Florence Knoll Bassett (see “Shu U,” Metropolis, July 2001). But two years later, when she invited me to spend the day with her at the White House, I was stunned. How many times do you get invited to the White House—let alone with a legendary designer? On March 6 I joined a small group of Bassett’s family members and friends to watch her receive a National Medal of the Arts from President George W. Bush. 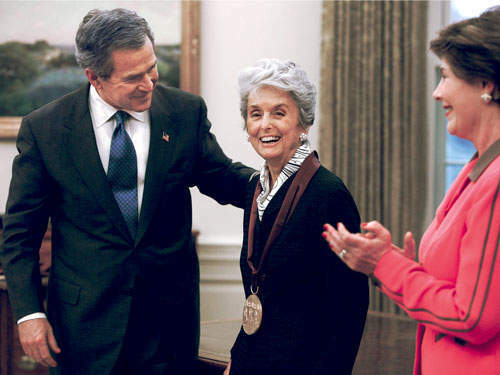 She was one of nine honorees celebrated that day with the nation’s highest honor for artistic excellence, a group including landscape architect Lawrence Halprin, museum director Philippe de Montebello, the late caricaturist Al Hirschfeld, and singer Smokey Robinson. 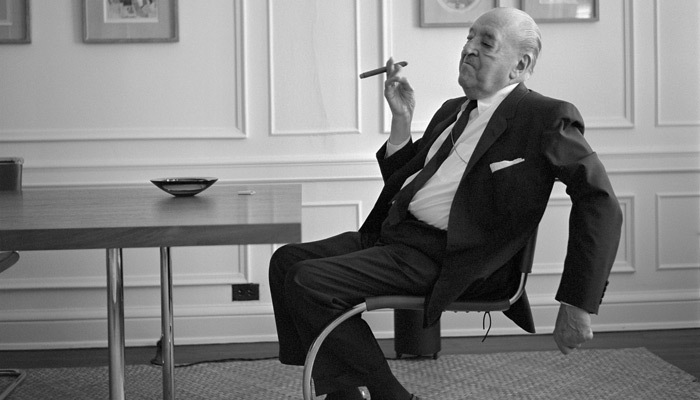 Educated by architects Eliel Saarinen and Ludwig Mies van der Rohe, Bassett designed the interiors of CBS, in New York; Connecticut General, in Hartford, Connecticut; and the Heinz Company headquarters, in Pittsburgh. As a pioneer of the Knoll Planning Unit, she revolutionized interior space planning. Bassett’s application of design principles in solving space problems was a radical departure from standard practice in the 1950s, but was quickly adopted and remains widely used today. Bassett is one of a generation of designers who had a democratic and social understanding of design. At a time when resources were scarce, she did more with less and found inventive solutions out of necessity. Within these constraints, Bassett found the freedom to do what we refer to as Good Design. It’s a lesson that resonates in today’s economic climate. Smart designers can do well with less—and they can start by getting rid of the tassels. 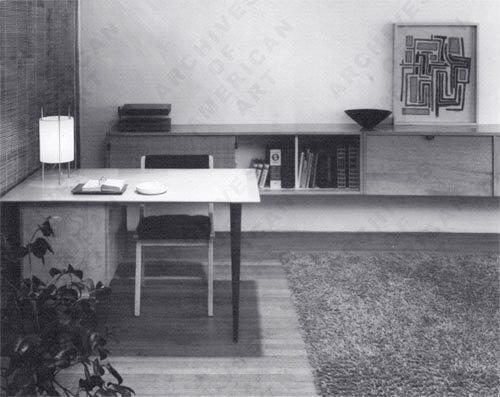 Florence Knoll Bassett even designed her own archive that she donated to the Archives of American Art in 2000. It is not uncommon for donors to provide the Archives with annotations or notes about their papers or the papers of their families. 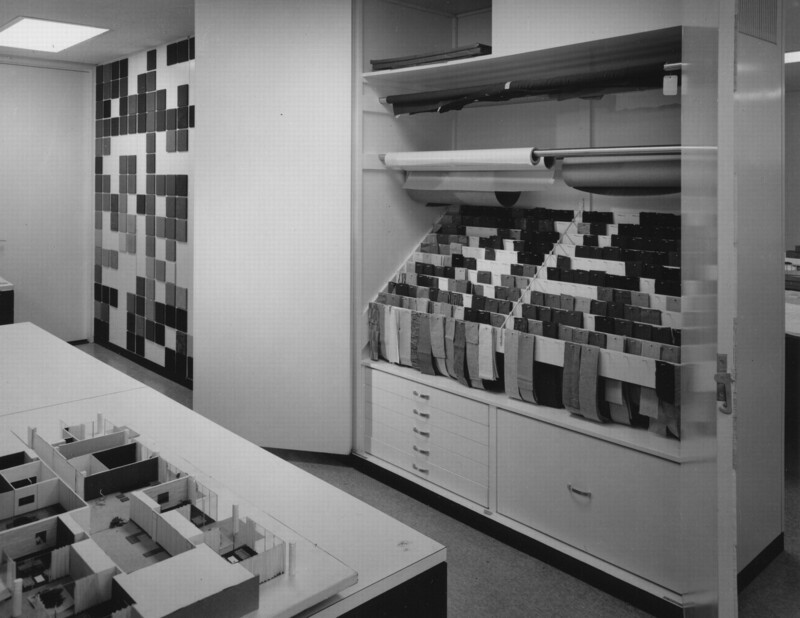 Florence Knoll, however, curated the entire contents of the collection, arranged the papers into portfolios and color–coded files, and provided a detailed inventory. Representative of her “total design” philosophy, she also designed and had custom archival boxes made to house the collection! We have been careful to maintain Knoll’s original order and containers, adding only acid–free folders to better preserve the materials. 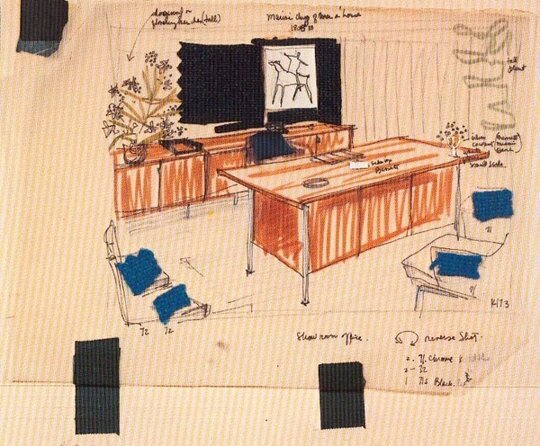 Depicted in this blog post is page 10 from one of the portfolios designed, compiled, and annotated by Florence Knoll in 1999 prior to donating her papers to the Archives of American Art. The portfolio includes copies of designs from all periods of her career, and copies of letters and photographs of individuals and significant events throughout her life. Biographical text, written by Knoll Bassett, accompanies the material. 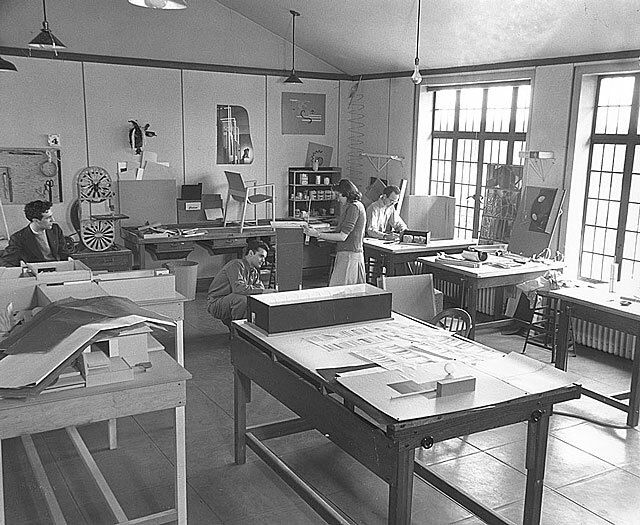 It was Rapson’s friendship with Florence Schust, the talented designer and future wife of Hans Knoll, that brought Rapson designs to the mass market and out of studio production. 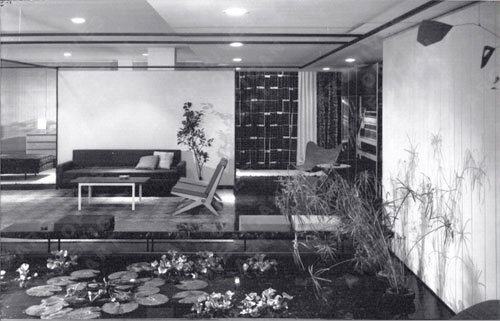 The Hans G. Knoll Furniture Company had been established in New York City in 1938. In 1941, the first Knoll modern furniture line was released – the “600 Series”, most of which was designed by Jens Risom, but would later include all the pieces of the Rapson Line for Knoll as well. 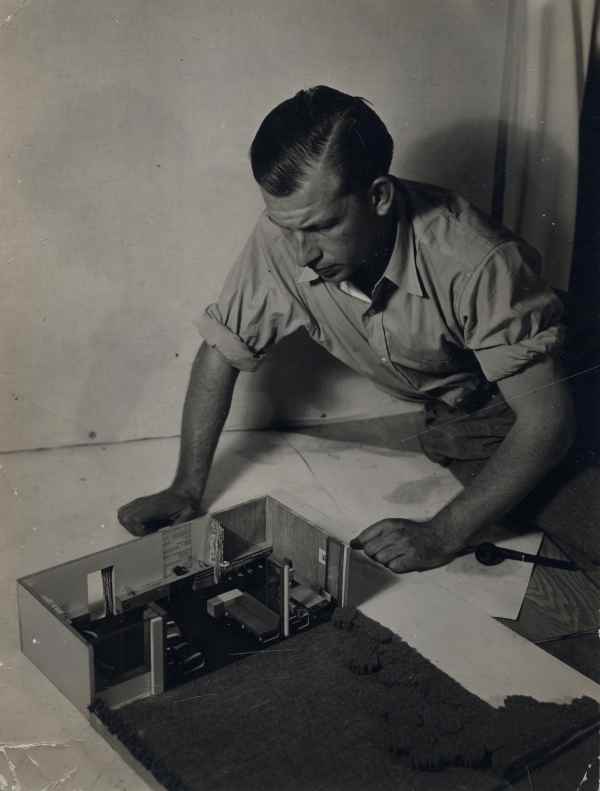 In 1944, Knoll and his wife, Florence Schust Knoll, established the Knoll Planning Unit to lead the research/design project he called “Equipment for Living” which was to prepare for a dramatic change in furnishing style and material after the end of World War II. Knoll believed a closer collaboration between stream-lined production and the talented designers was needed to successfully bring quality, affordable modern furniture to the masses. To set the project off on the right foot, Florence looked to Cranbrook for cutting-edge designers. 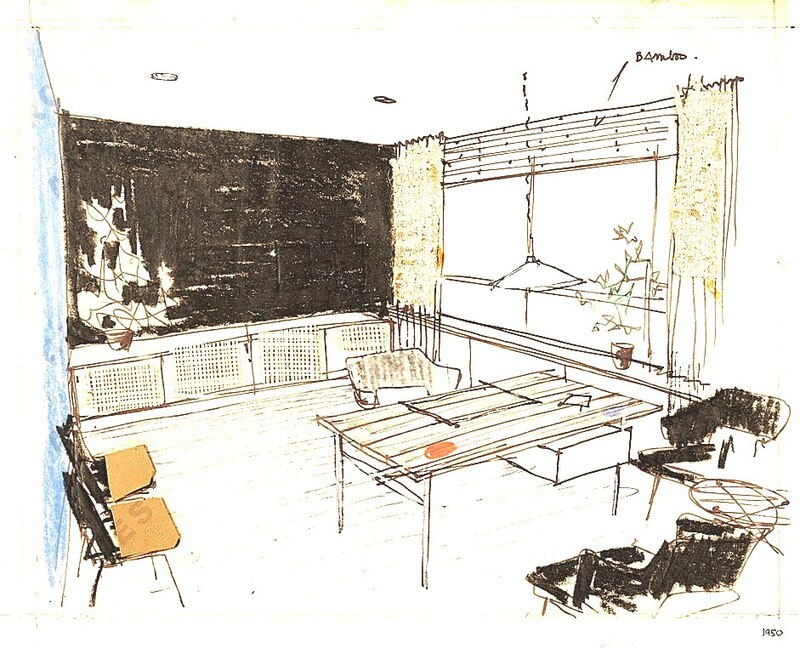 Rapson was the first selected for the Planning Unit, followed by Charles Eames, Eero Saarinen and six others who together designed many of the modern classics associated with Knoll’s dominant role in defining Modern furniture.